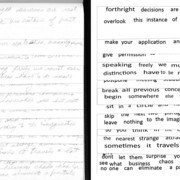 The primary goal of the diplomatic transcript is to present a deciphered text that gives clarity to a manuscript which is sometimes veiled by the idiosyncrasies of Weiner’s hand, the nature of the media (pencil), and the passage of time. 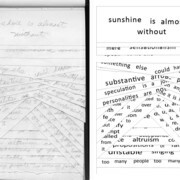 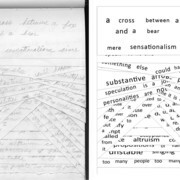 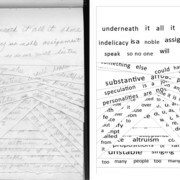 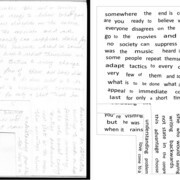 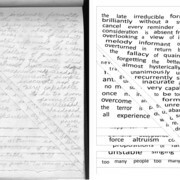 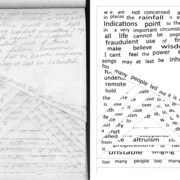 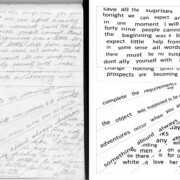 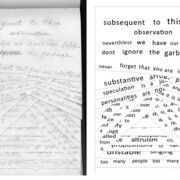 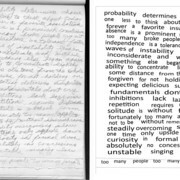 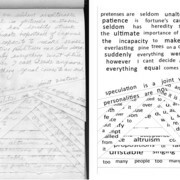 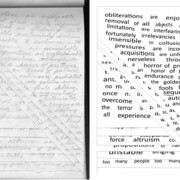 The fundamental requirement for any transcriber is to detach herself from certain fixed preconceptions about the text and the notebook and to act as a reflecting glass for what actually occurs on the page. 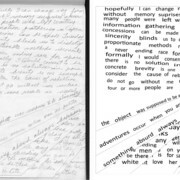 This is especially challenging in transcribing Weiner, where the temptation to read what is reasonable rather than what is in fact written is strong and compounded by her habit of composing fragmentary phrases for the reader to finish in her mind. 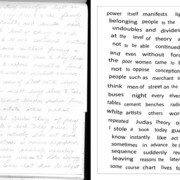 Thus during the first transcription of the notebook, we adopted the practice of transcribing individual lines from end to beginning, hopefully short-circuiting our impulse to misread or read willfully. 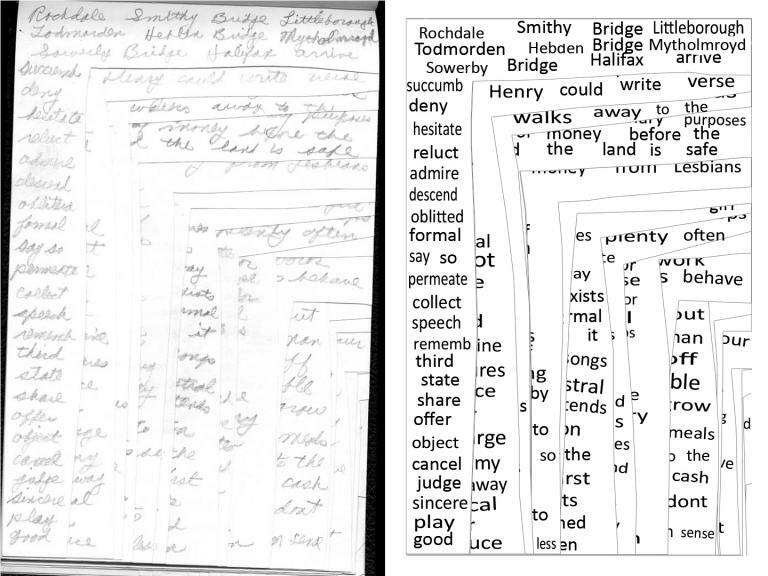 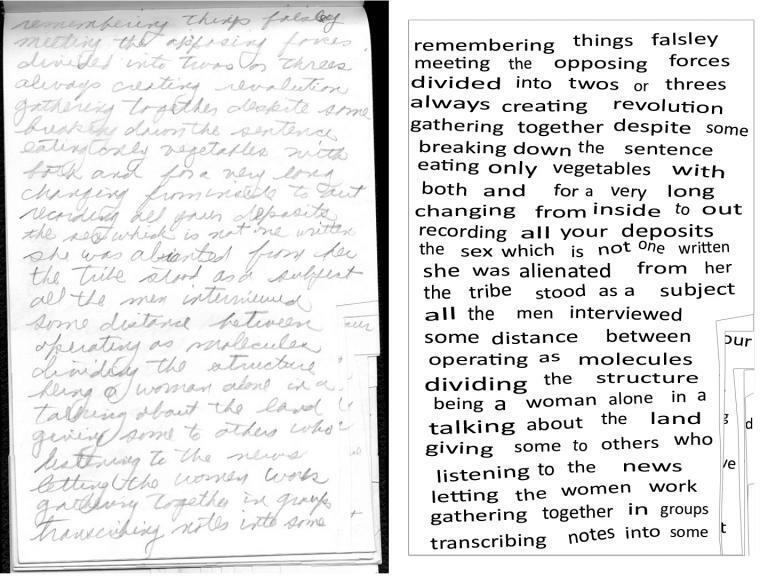 In the second full transcription, we reversed this process, then collated the two transcripts to discover our errors. After this, the transcript was proofread completely three times through a process of reading manuscript and transcript aloud. 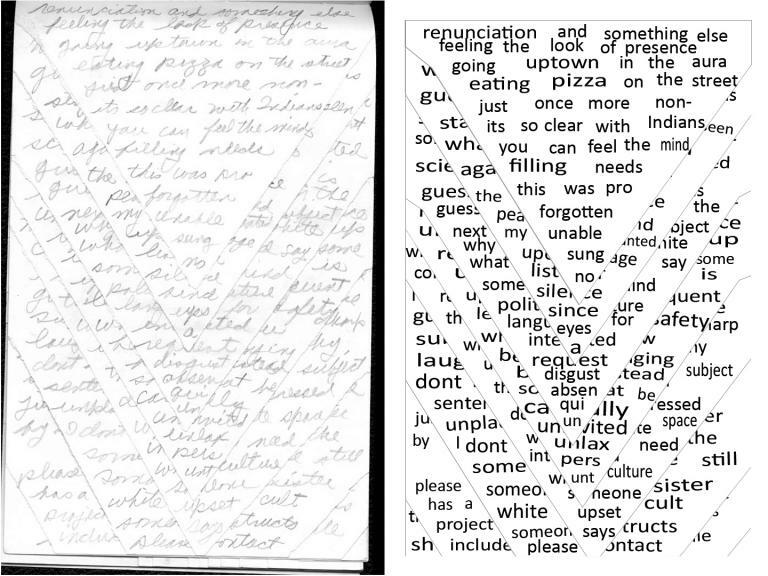 The painstaking process of transcription took more than two years. 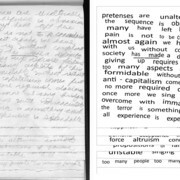 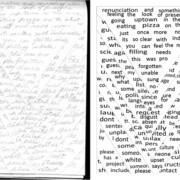 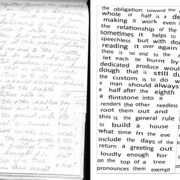 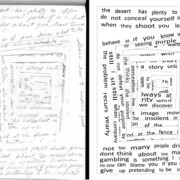 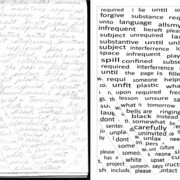 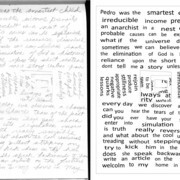 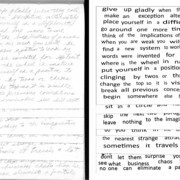 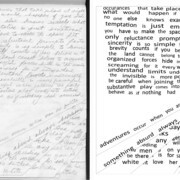 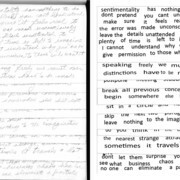 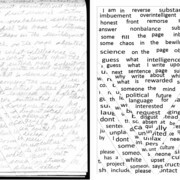 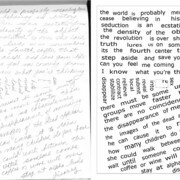 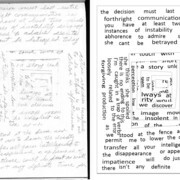 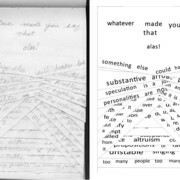 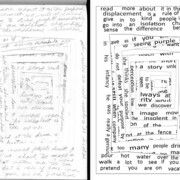 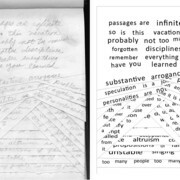 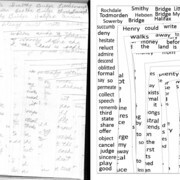 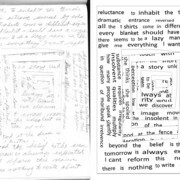 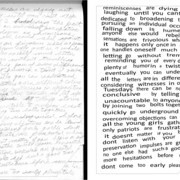 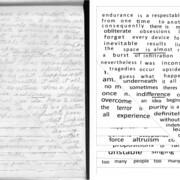 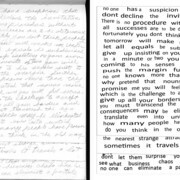 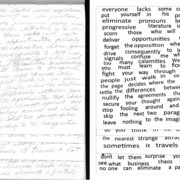 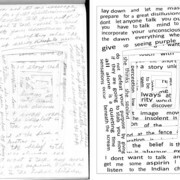 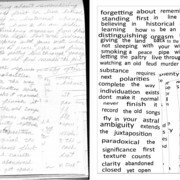 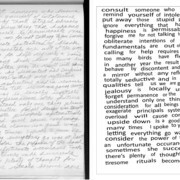 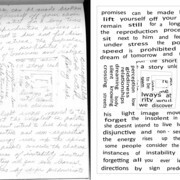 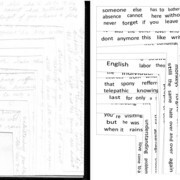 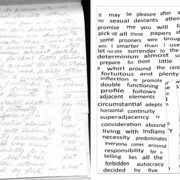 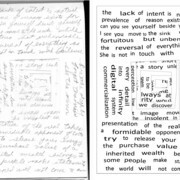 From the outset, we proceeded from the idea that everything on the page was of equal significance: spellings and apparently corrupted spellings, the sizes of words and their position on the page, the angle of the script from line to line, the presence of illegible and stray marks — all may be relevant to a reading of the work and all have been retained. 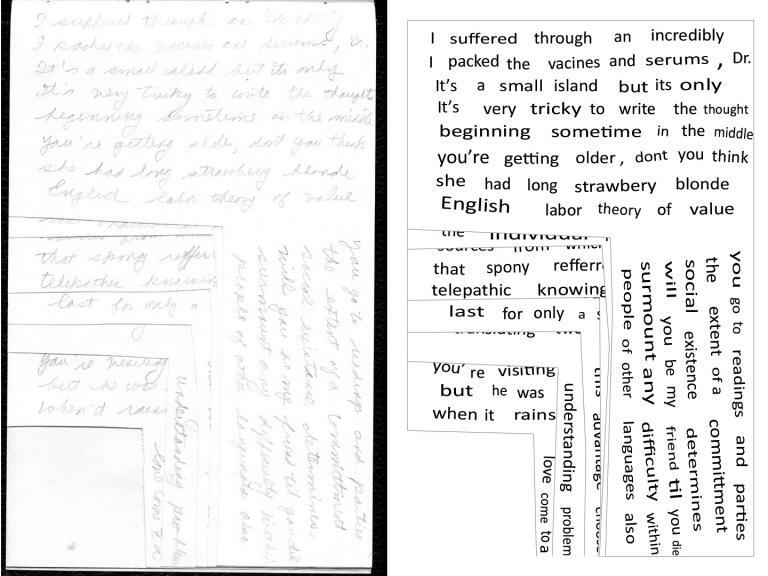 We hope that by following this method we offer a transcript that recovers a least a somatic trace of the original. 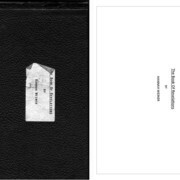 To create the diplomatic transcript of The Book Of Revelations, my research assistant Elizabeth Cattarin and I used Photoshop CS3 in combination with Adobe Acrobat 8. 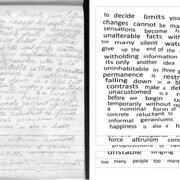 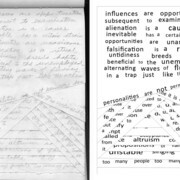 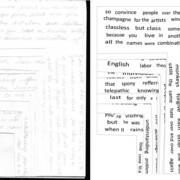 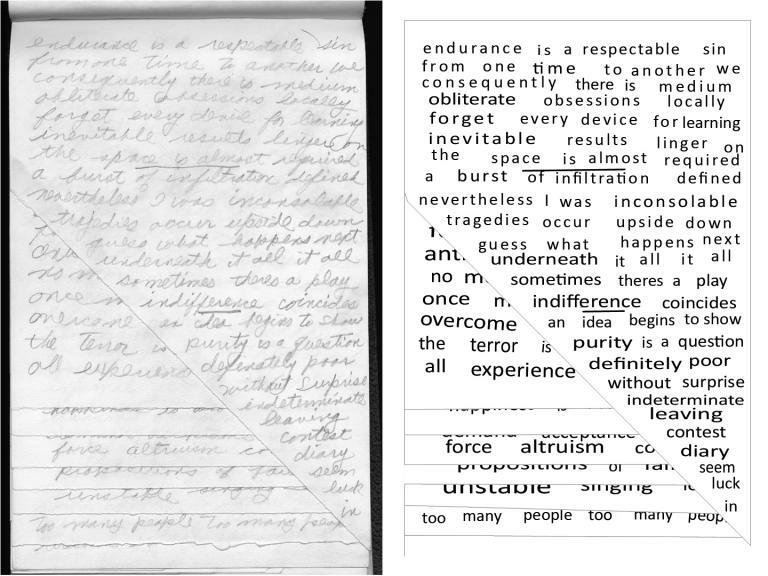 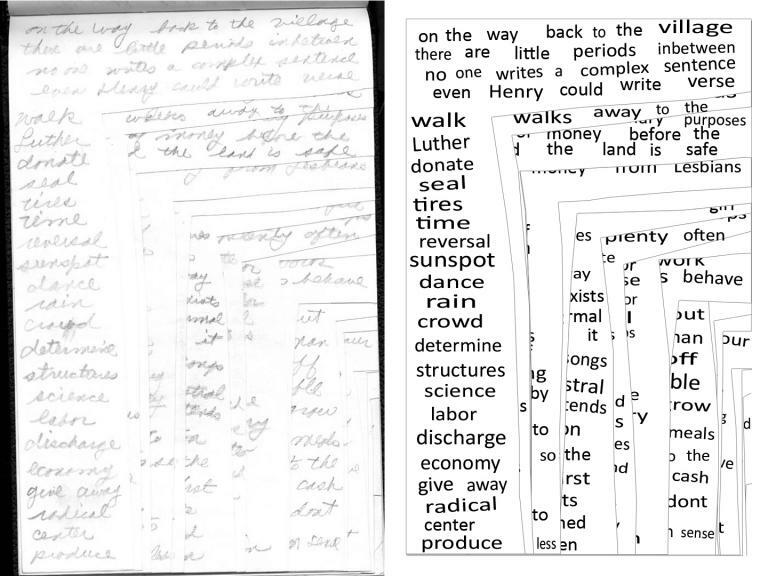 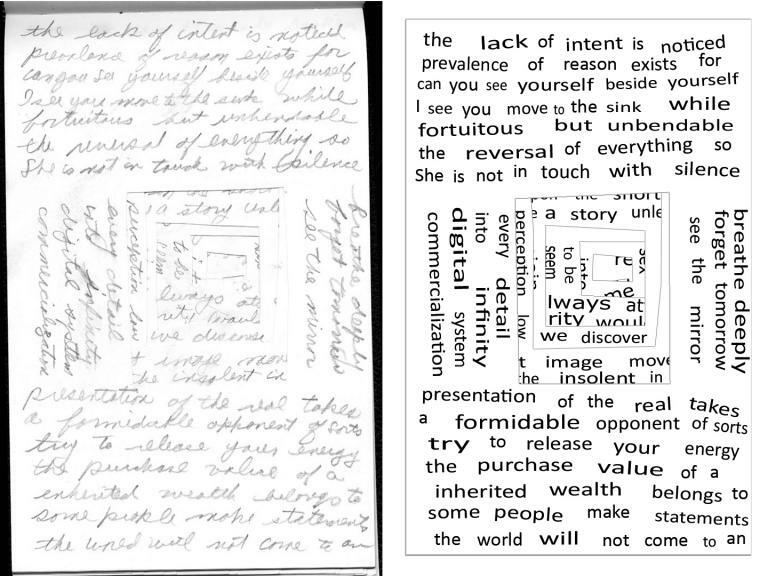 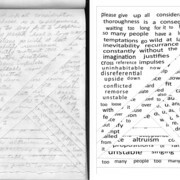 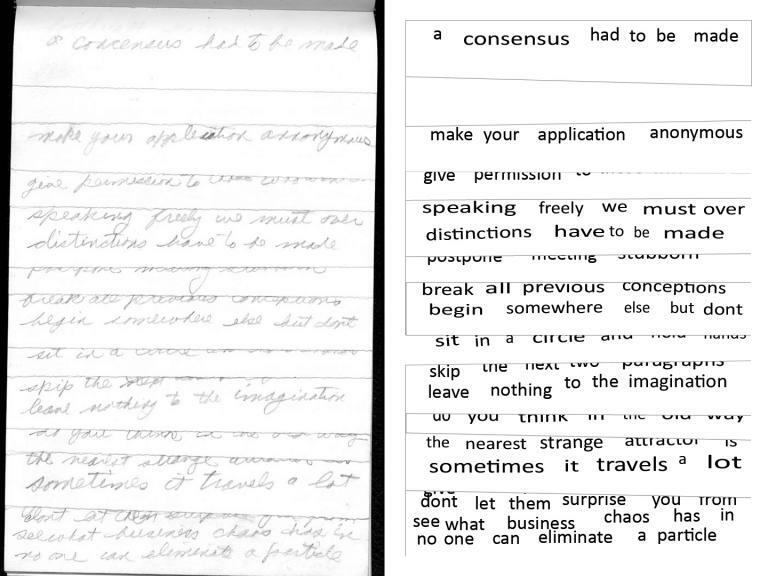 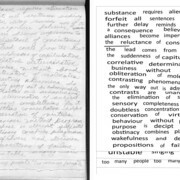 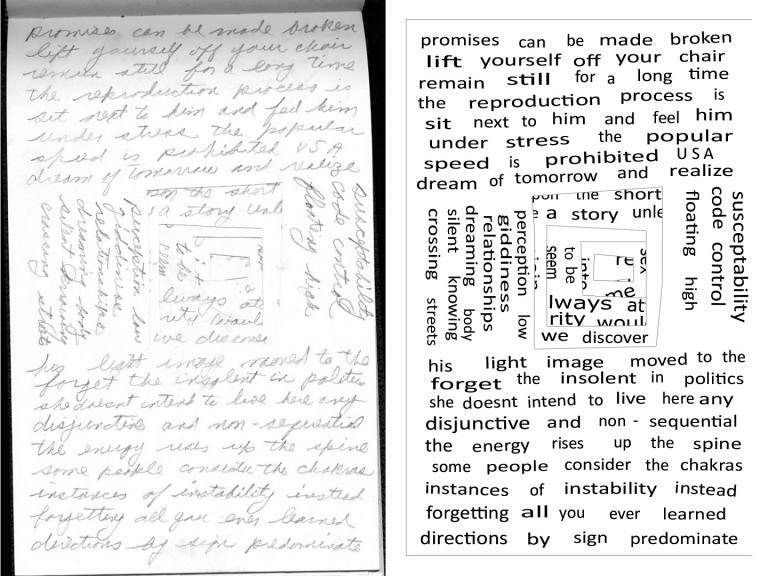 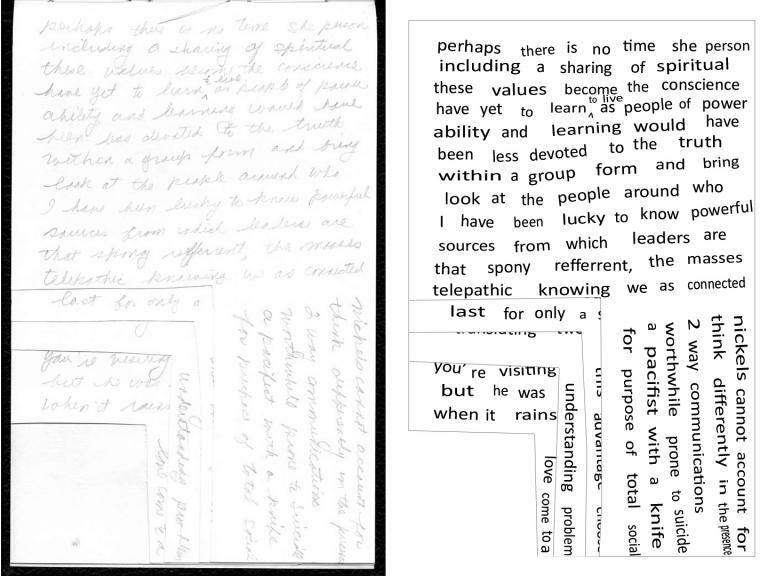 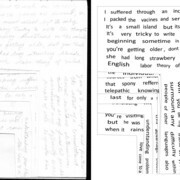 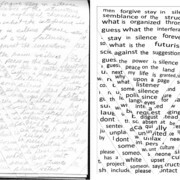 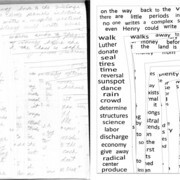 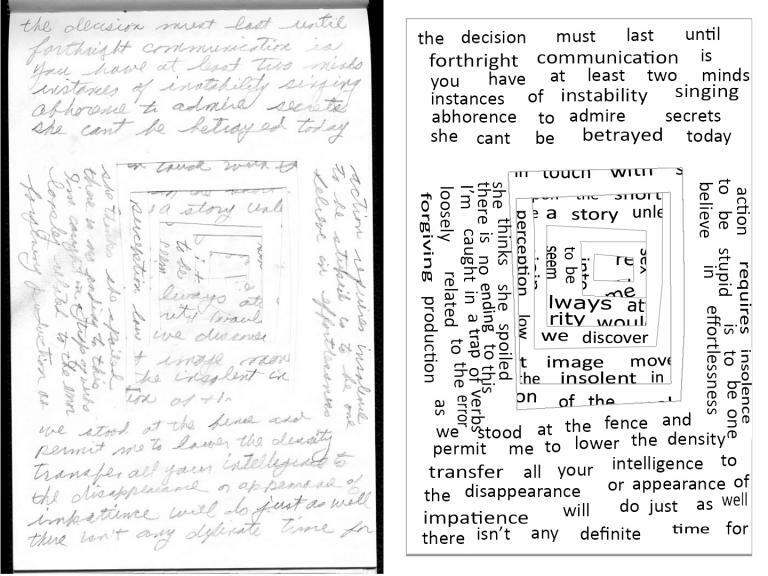 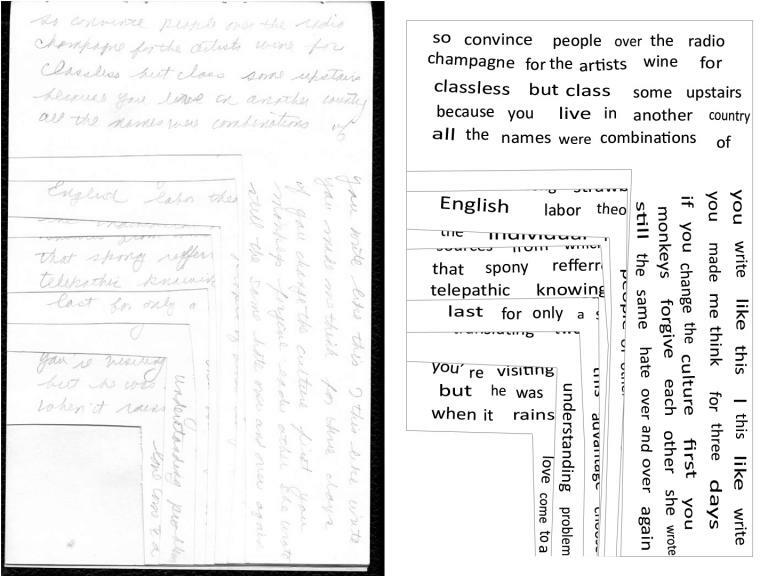 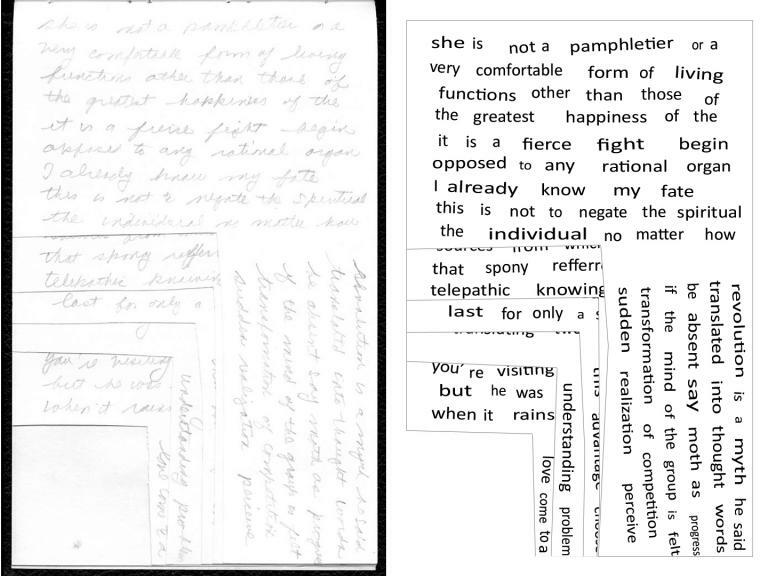 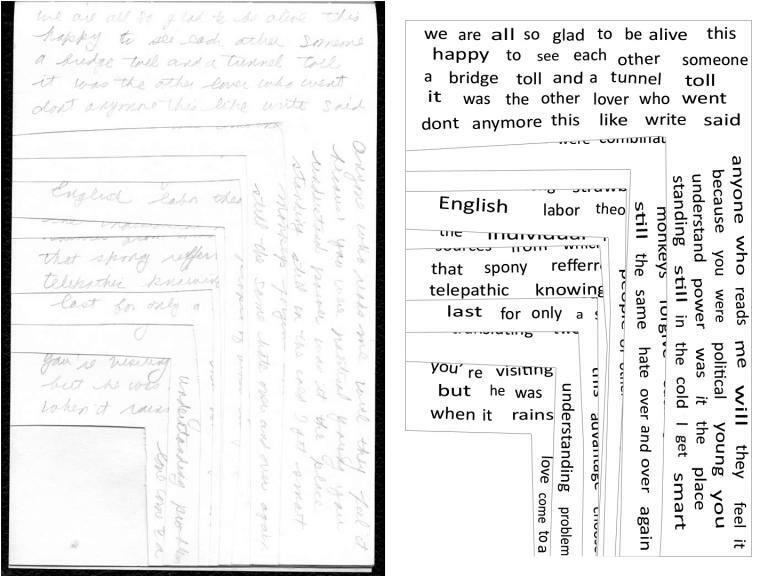 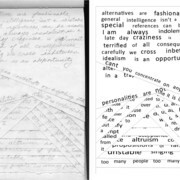 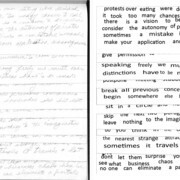 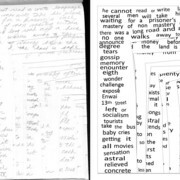 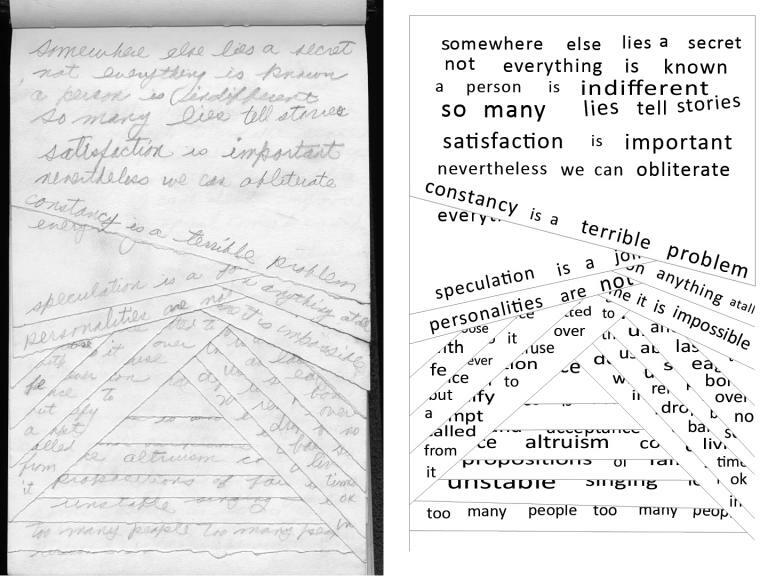 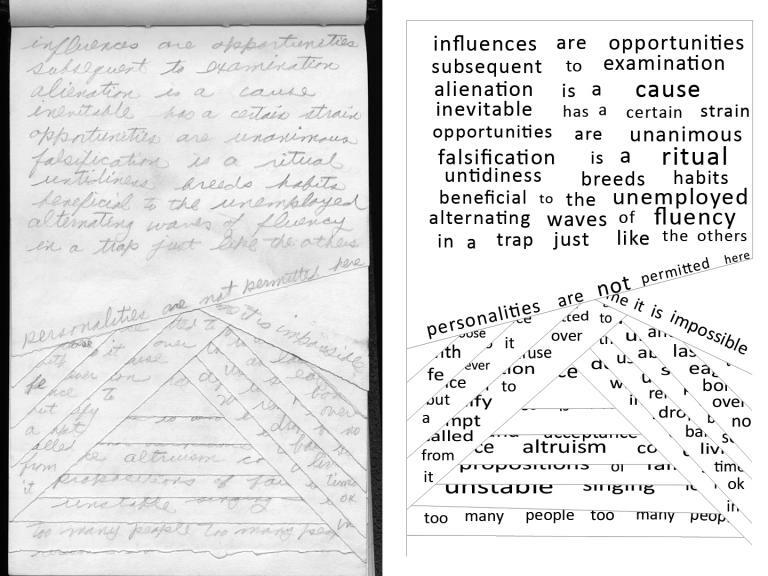 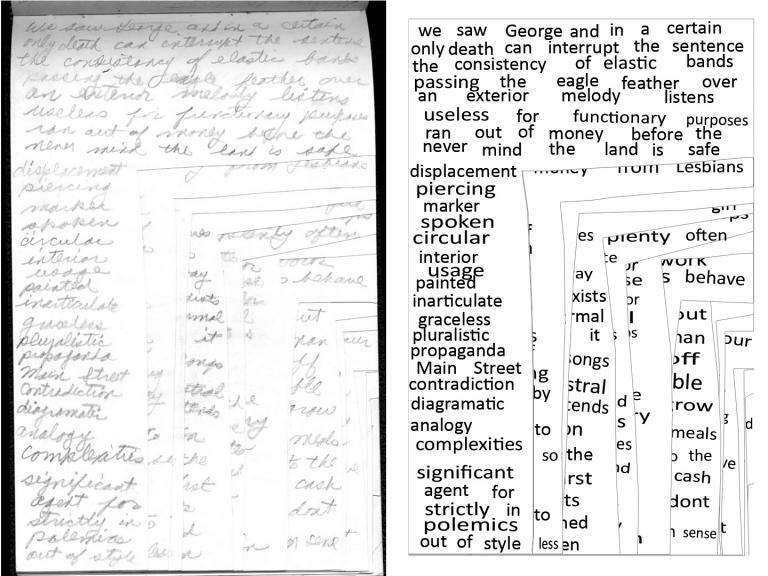 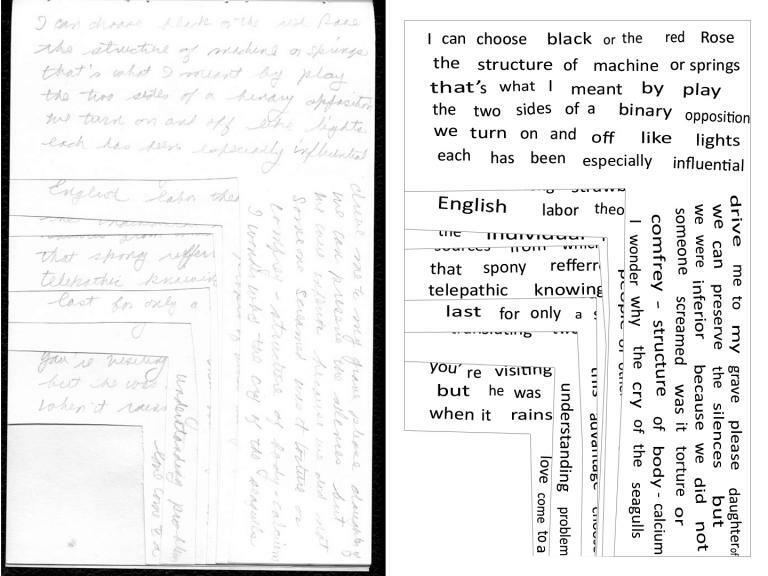 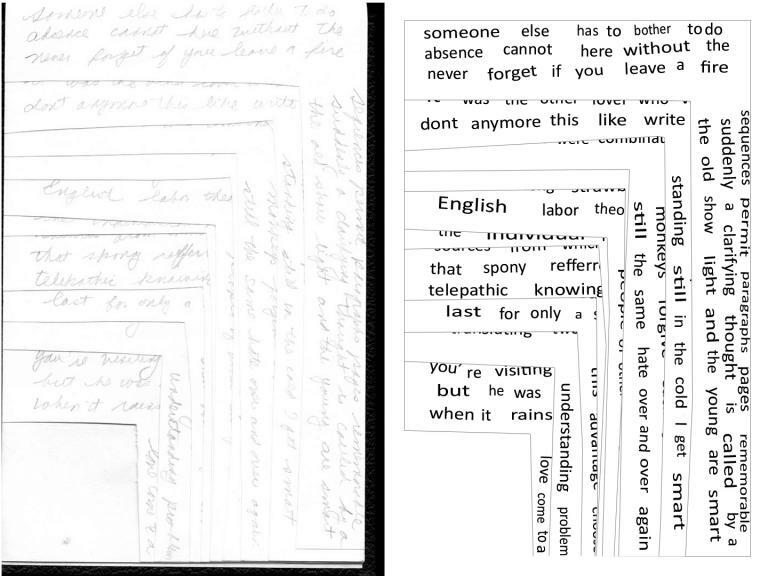 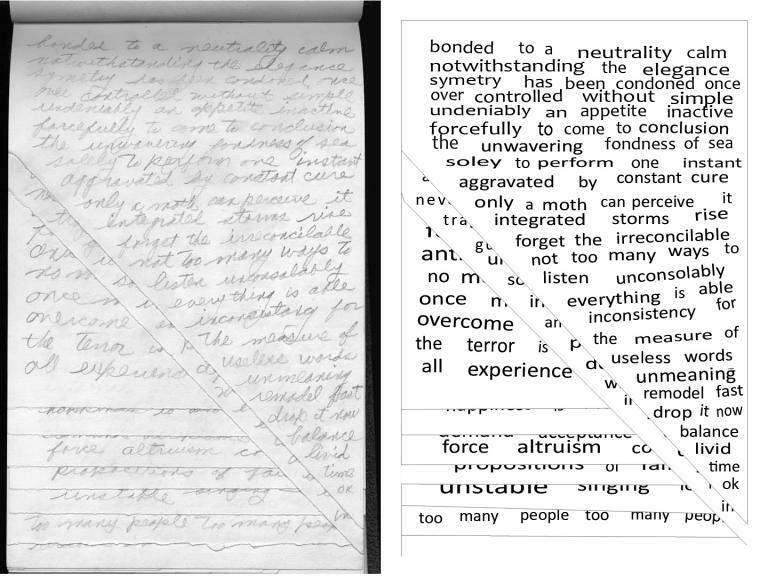 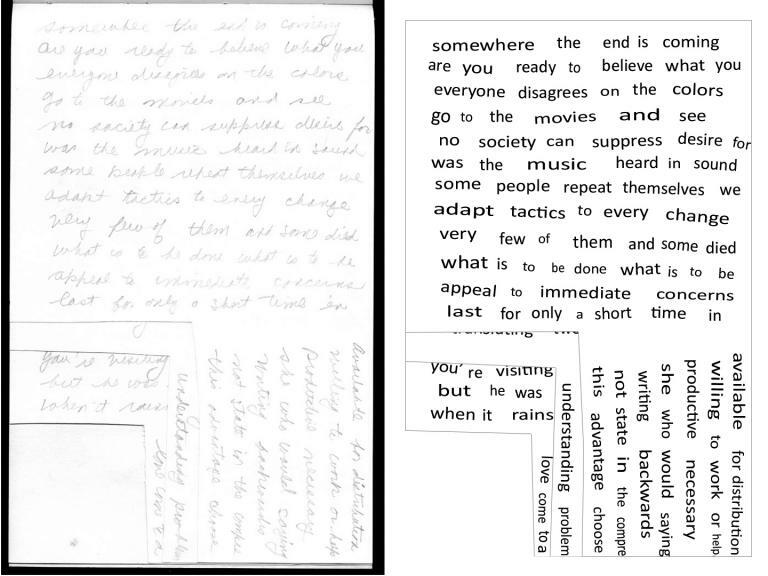 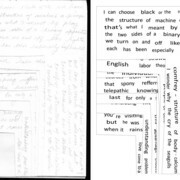 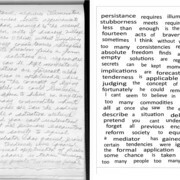 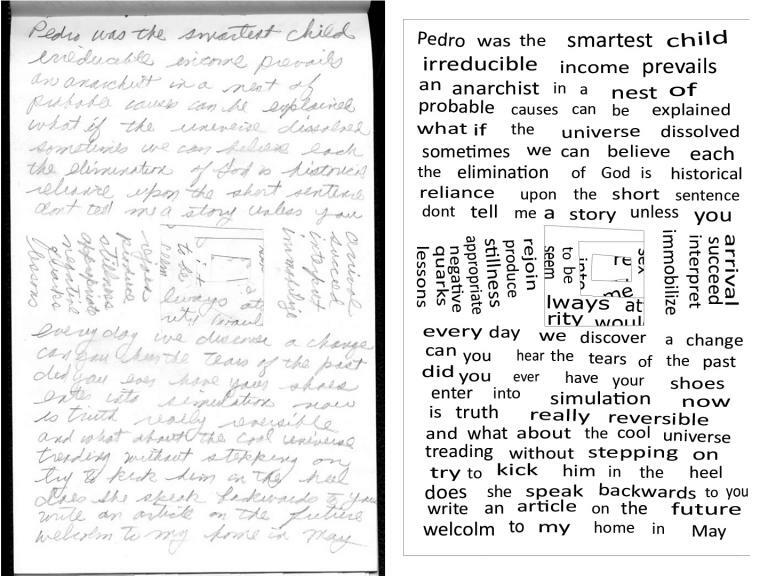 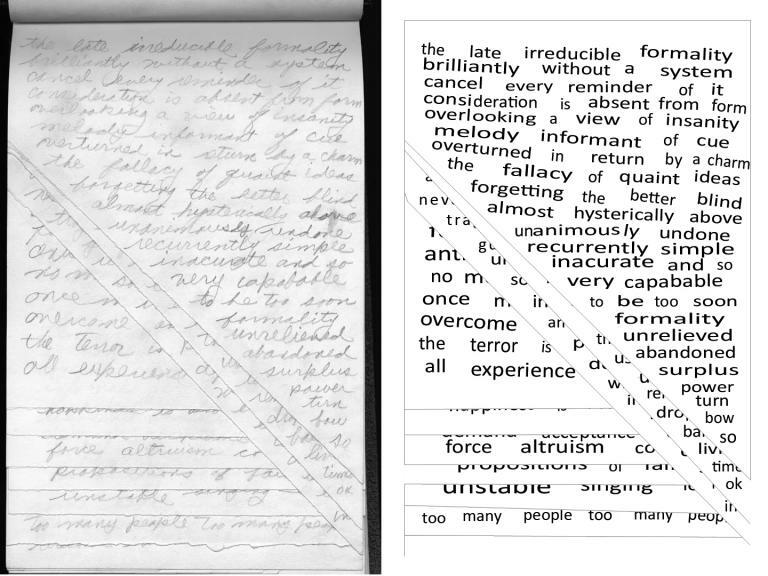 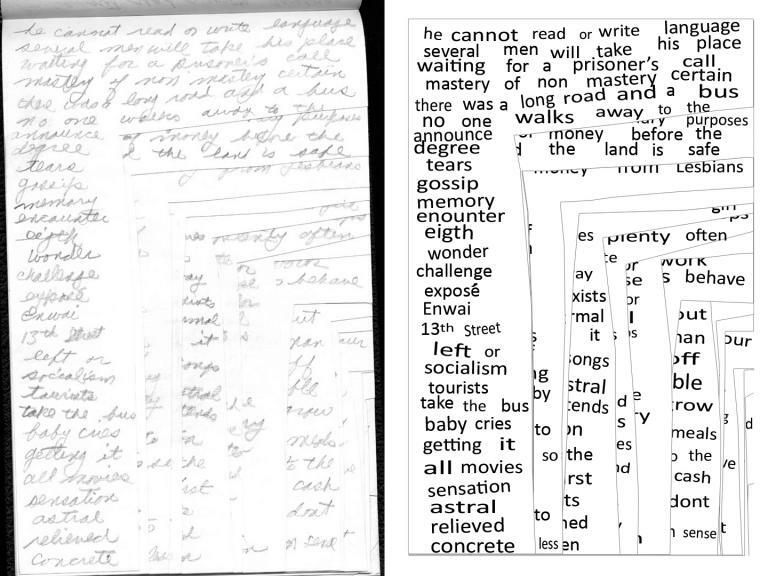 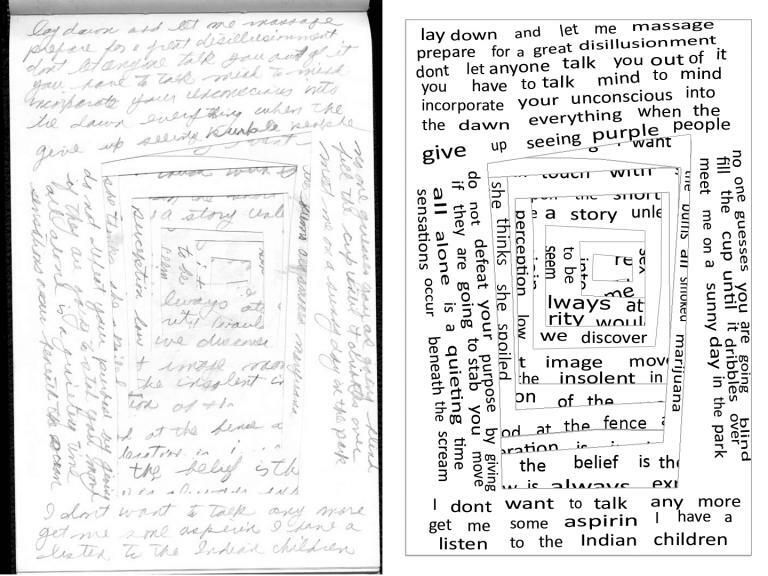 We began the transcription process by downloading the scans of the notebook displayed on the UCSD website and then loading them into Photoshop. 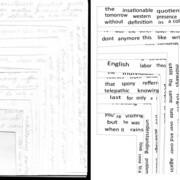 After capturing each page as a “layer,” we created a template in Photoshop that determined the outermost boundary of all of the pages. 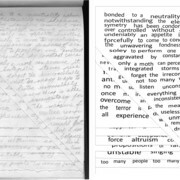 The result was a blank document with the same contours as the original notebook. 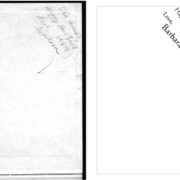 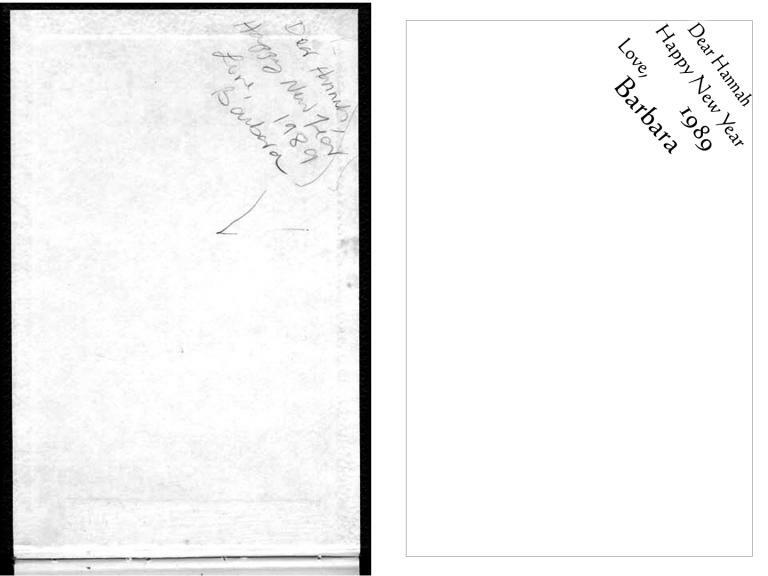 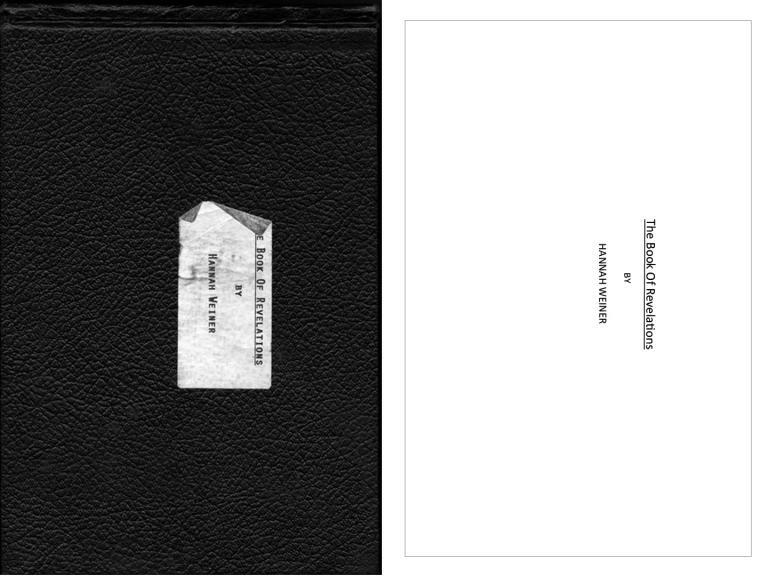 In this template, each page is in fact of set of three layers: the blank canvas, the transcribed text, and the original scan. 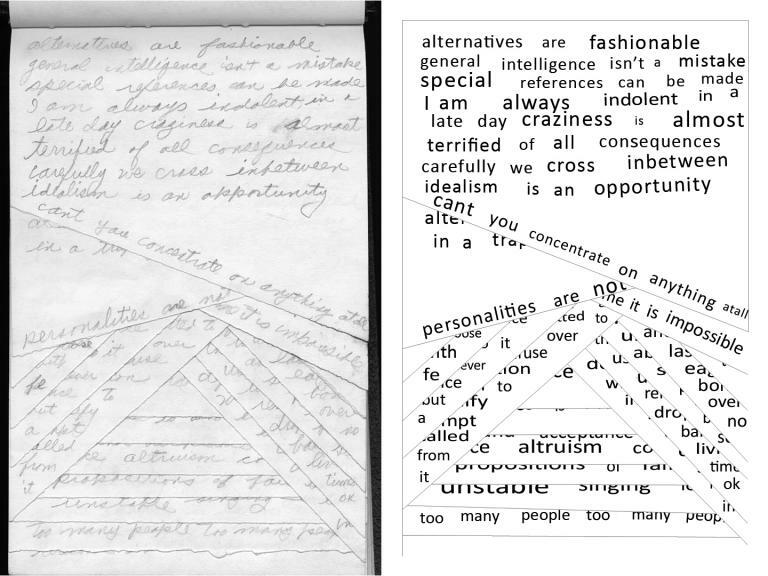 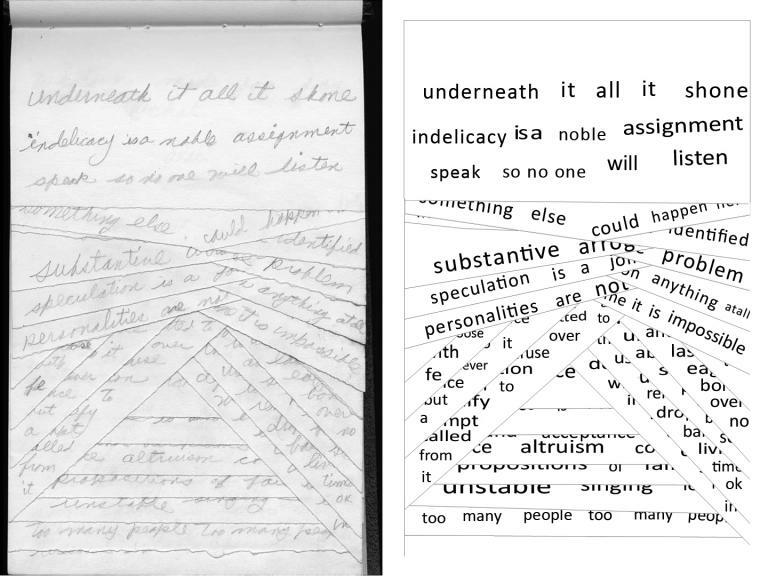 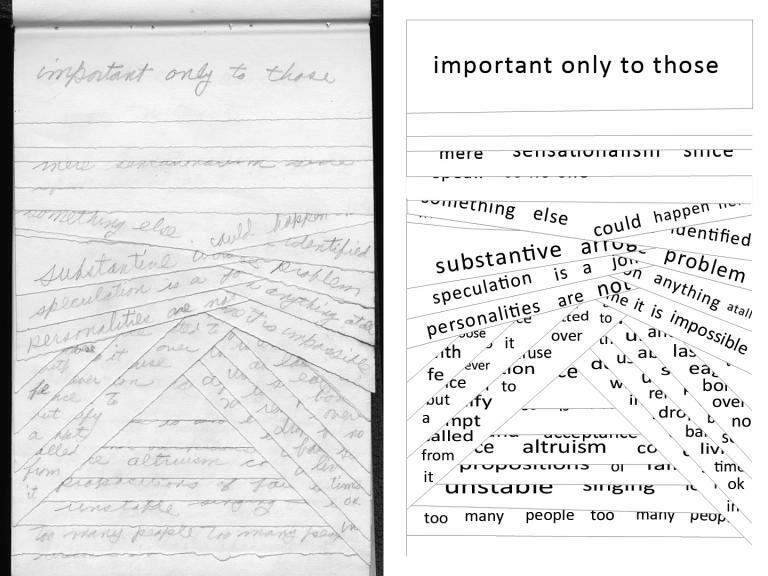 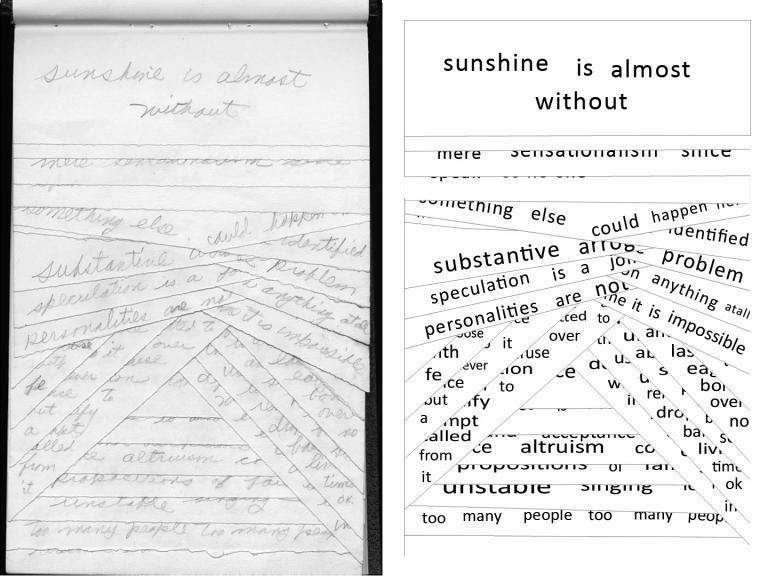 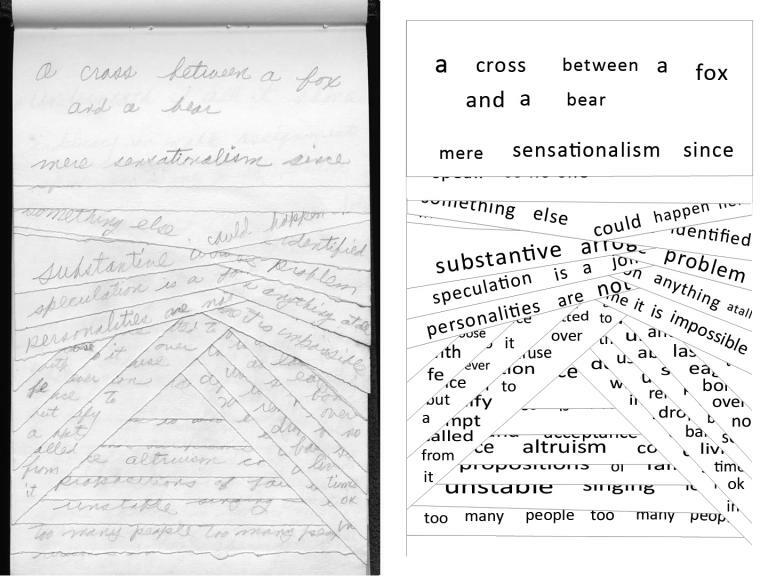 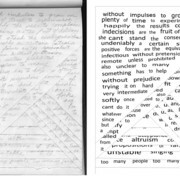 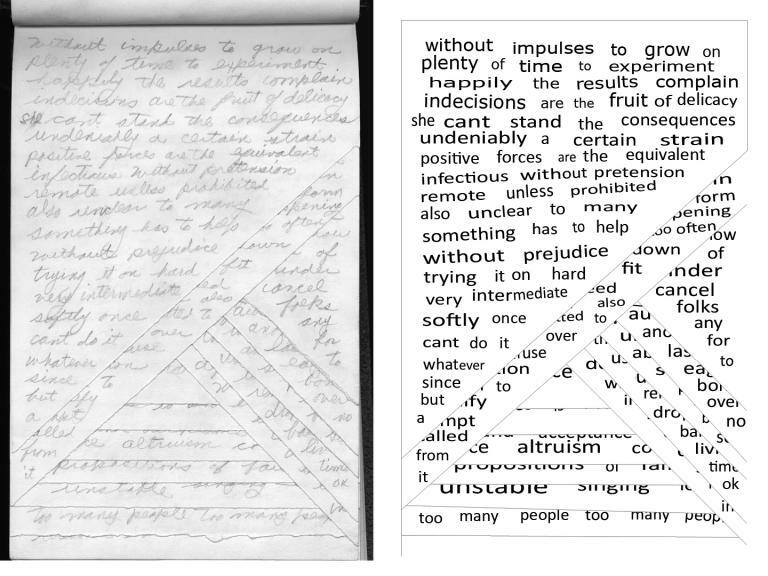 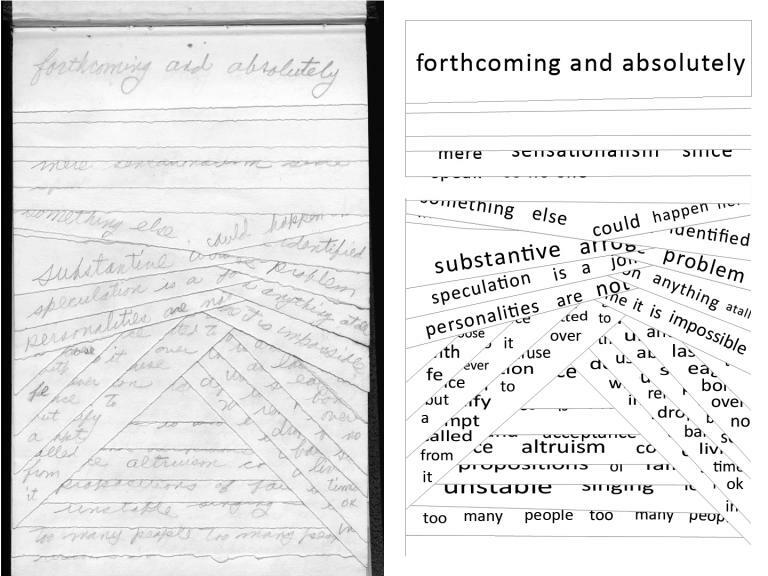 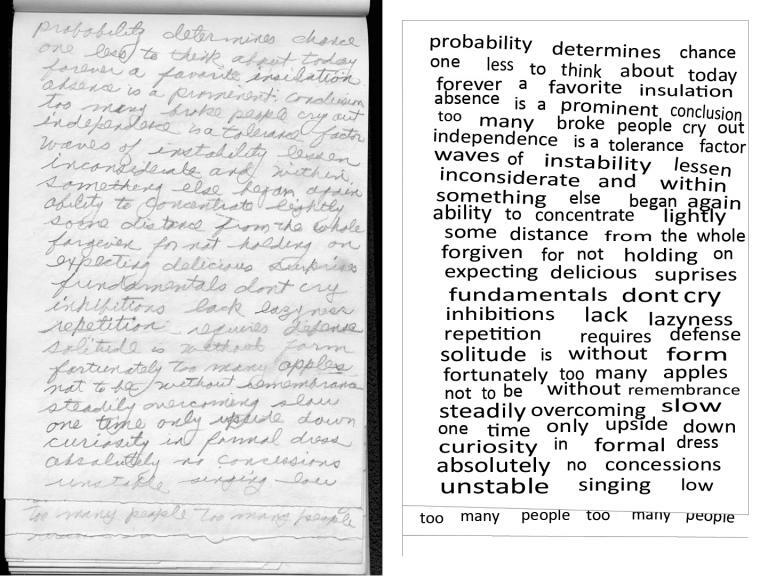 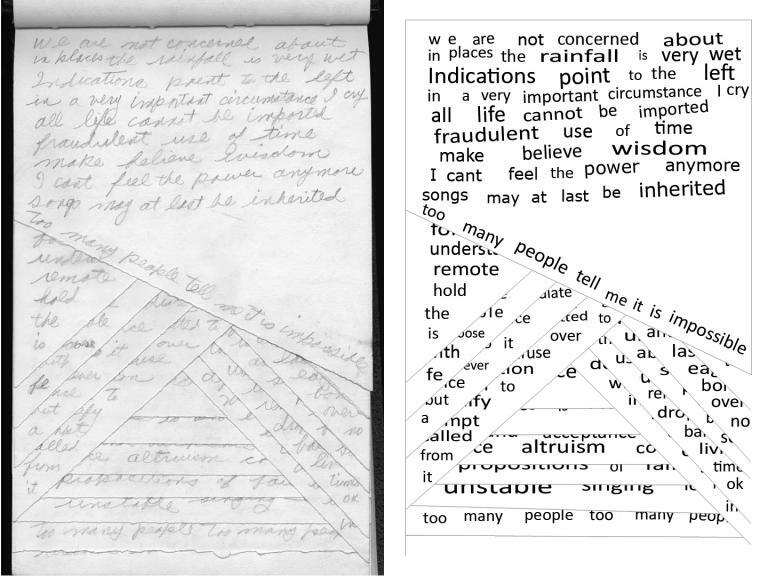 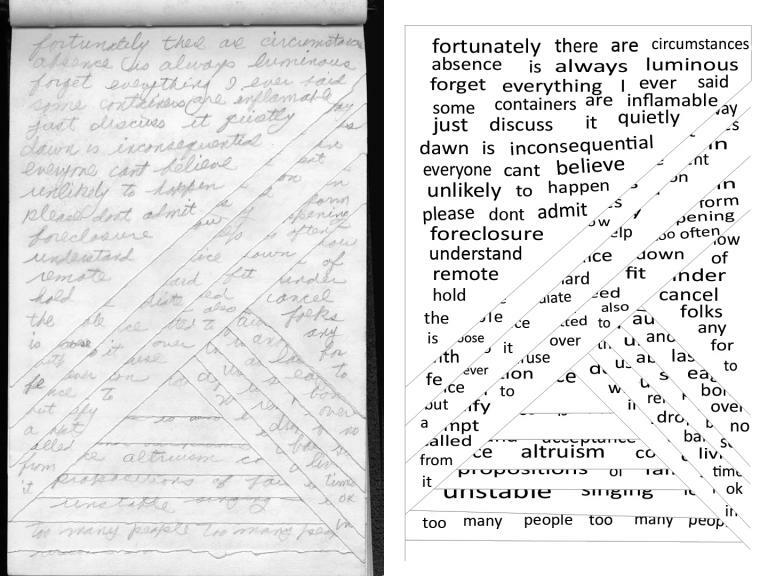 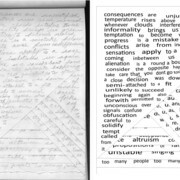 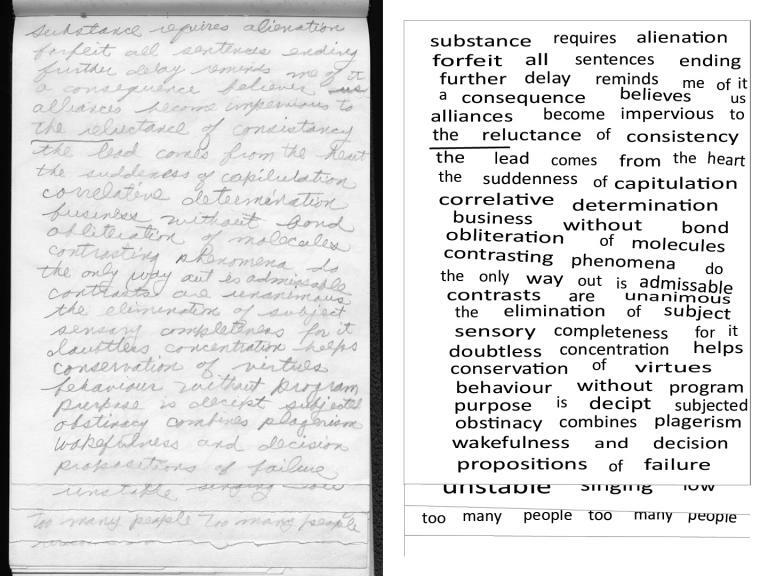 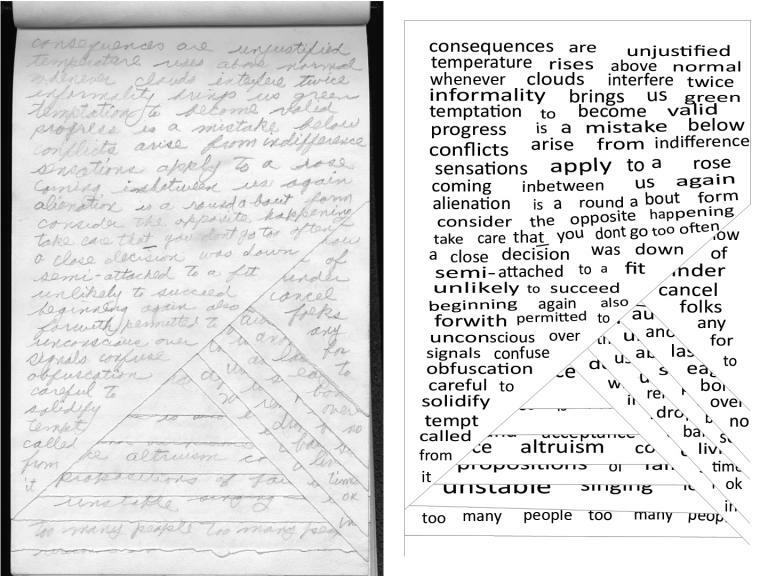 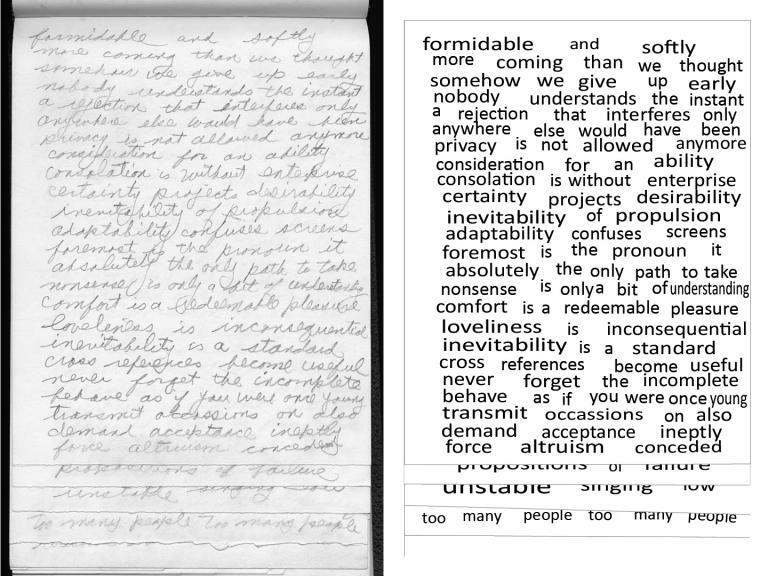 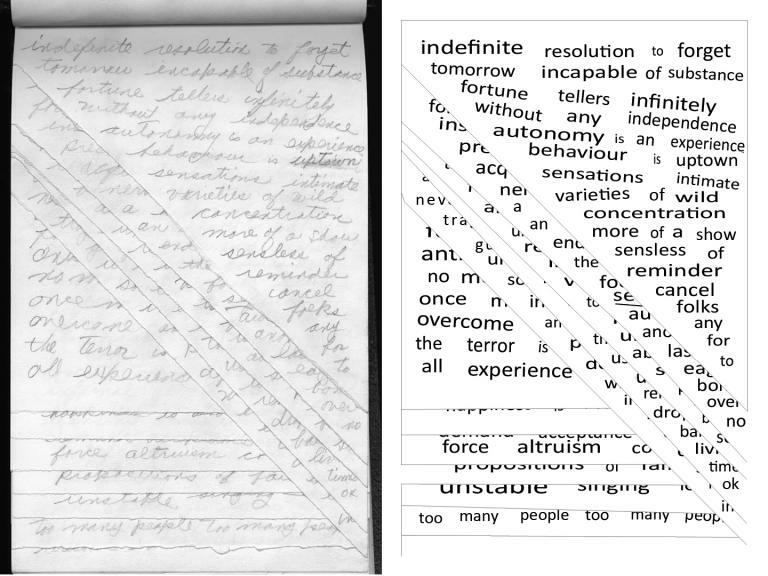 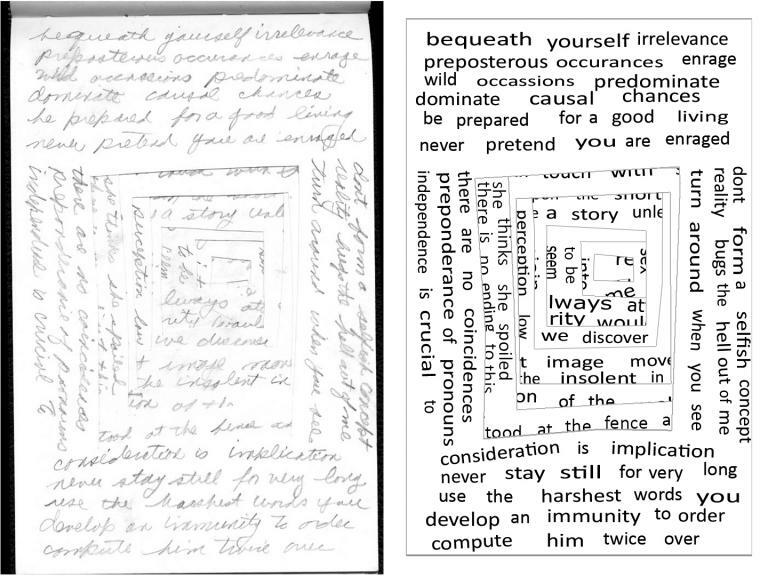 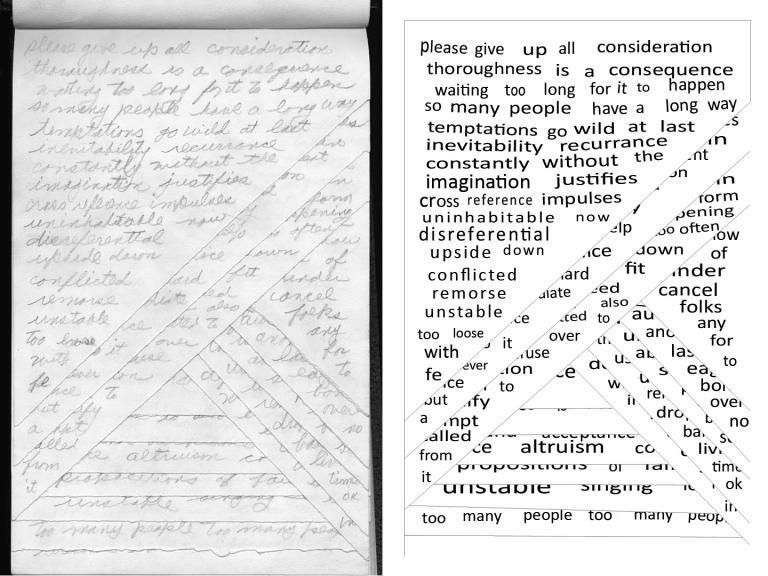 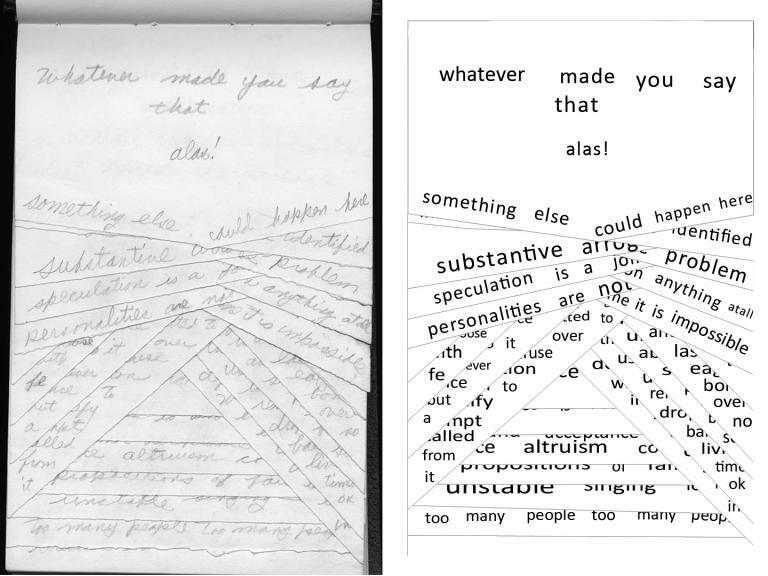 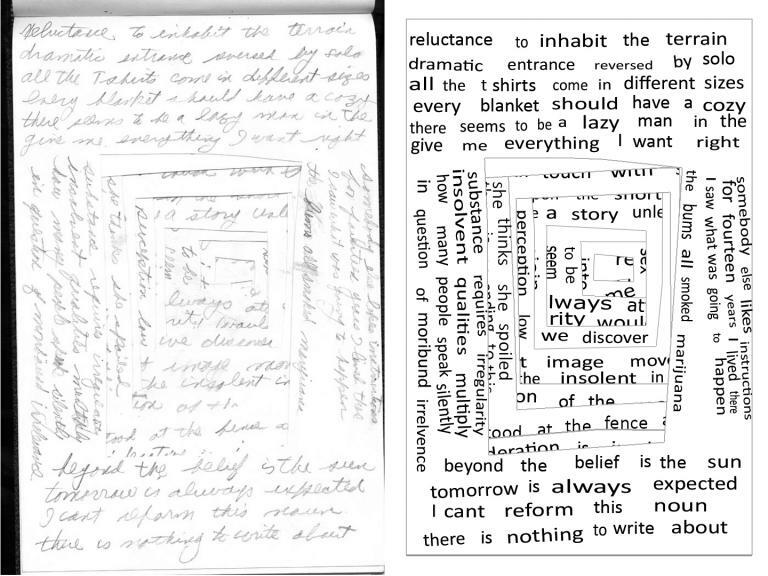 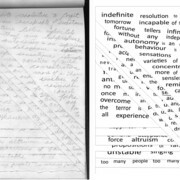 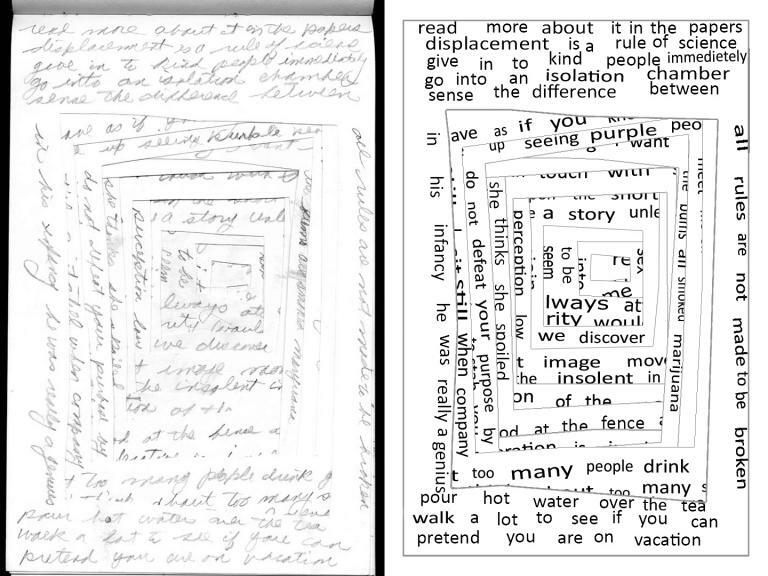 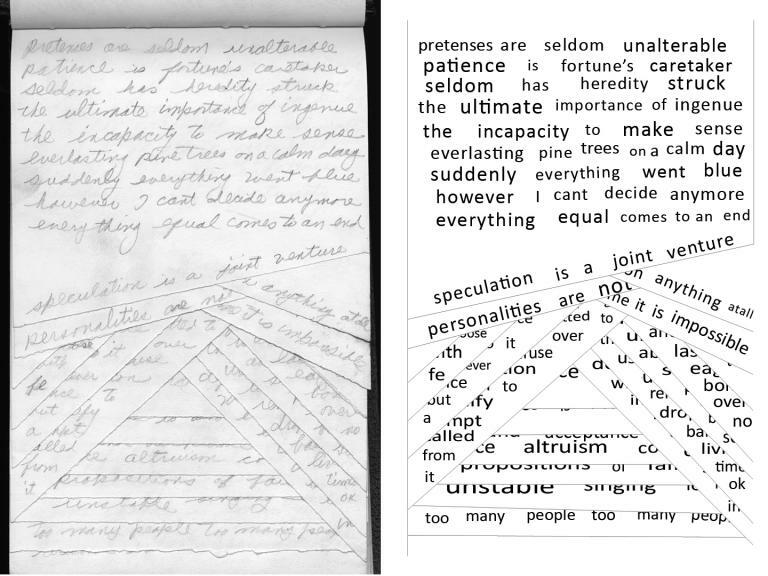 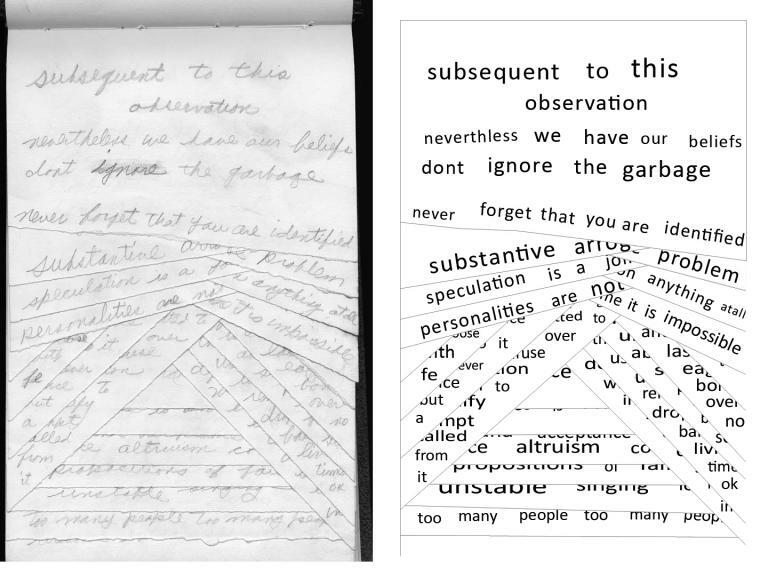 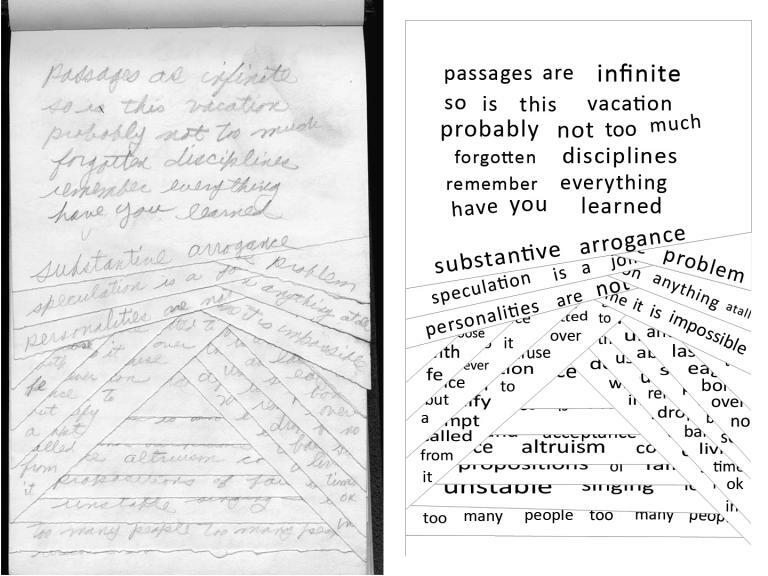 Each page of the notebook was transcribed in the same way. 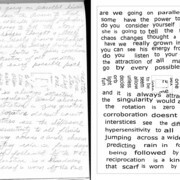 The original scan was called to the screen and then faded to approximately 50 percent opacity so that the text remained clearly visible. 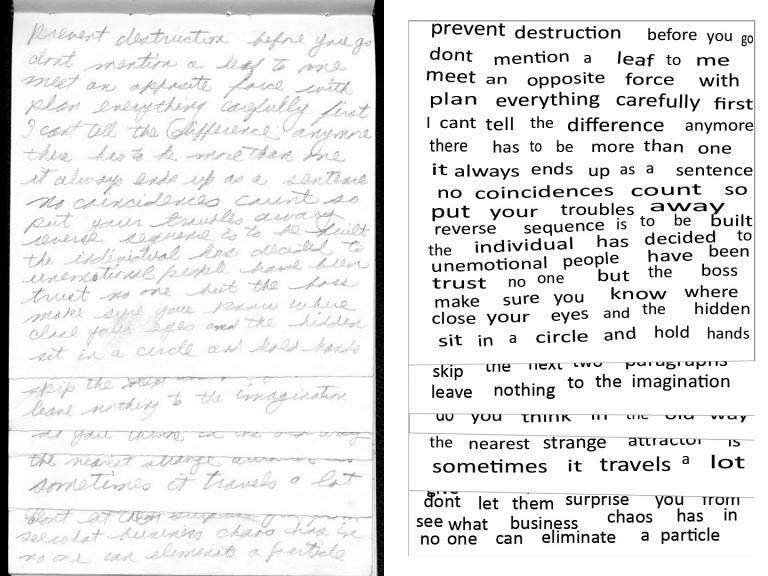 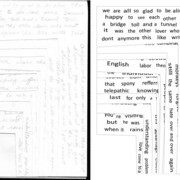 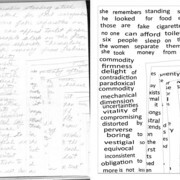 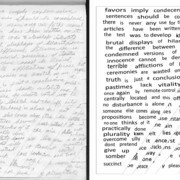 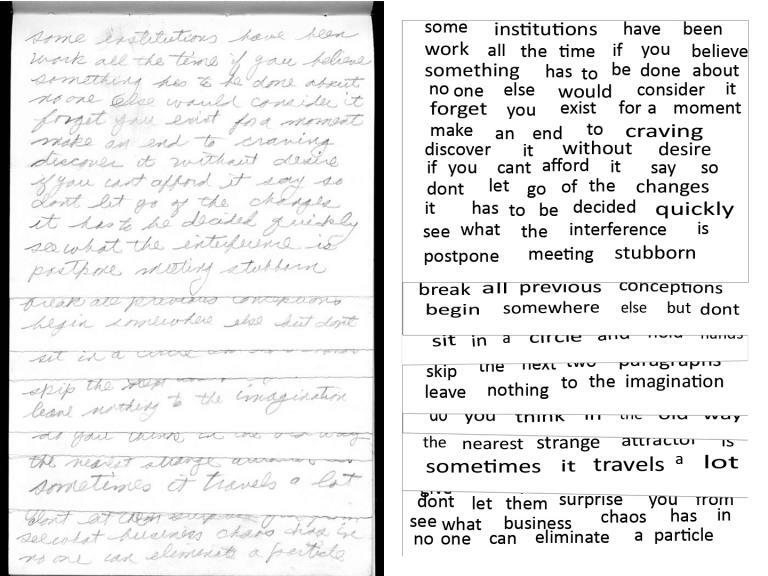 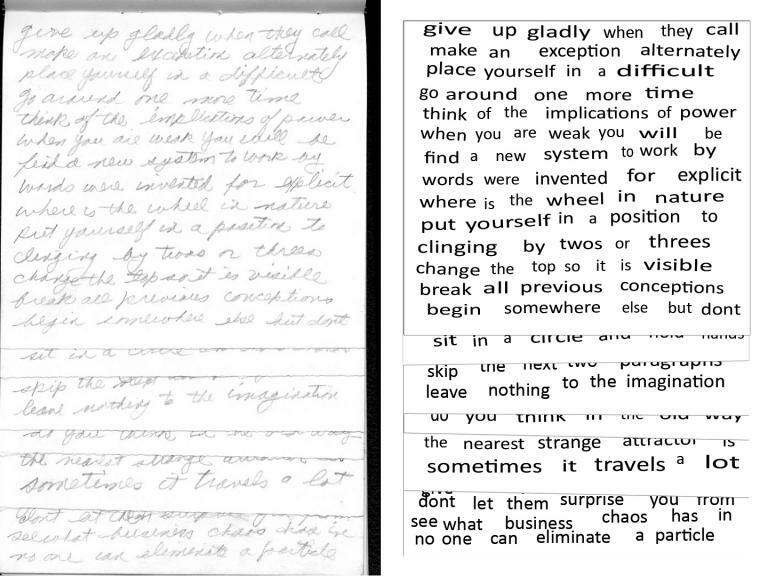 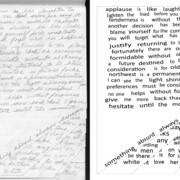 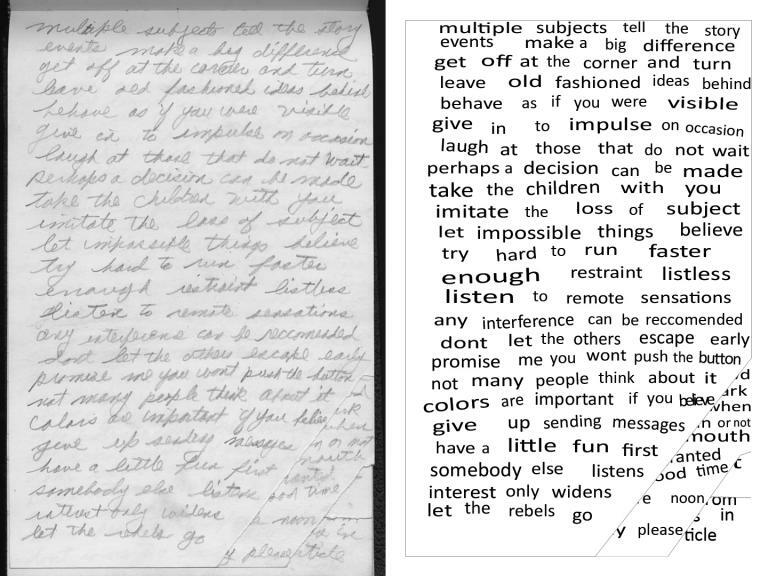 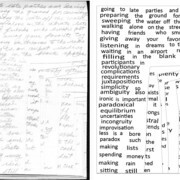 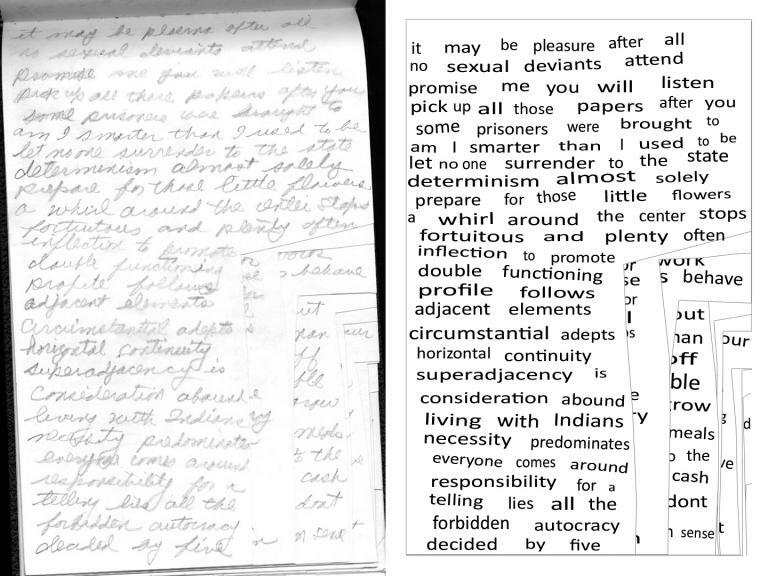 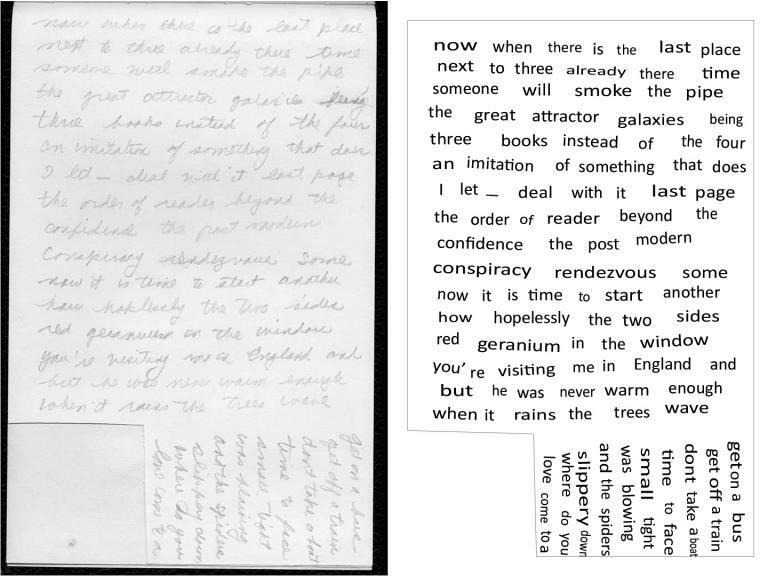 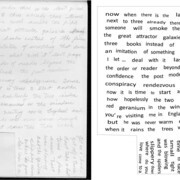 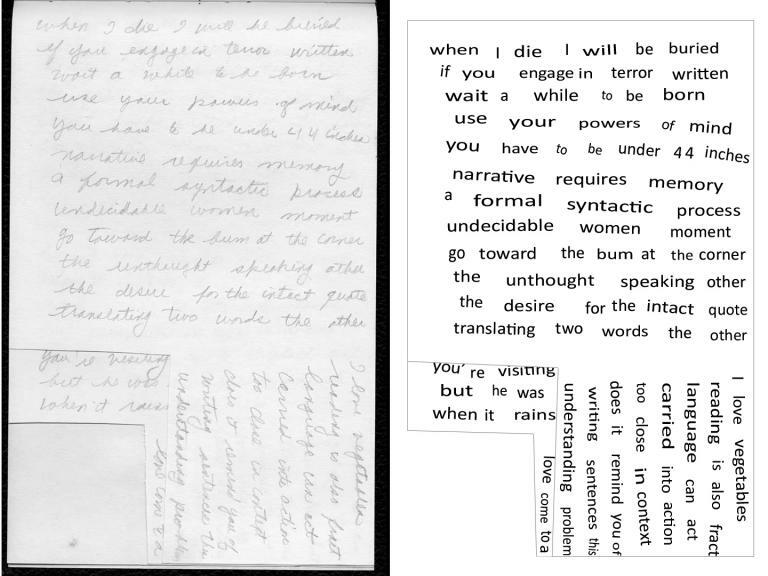 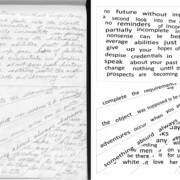 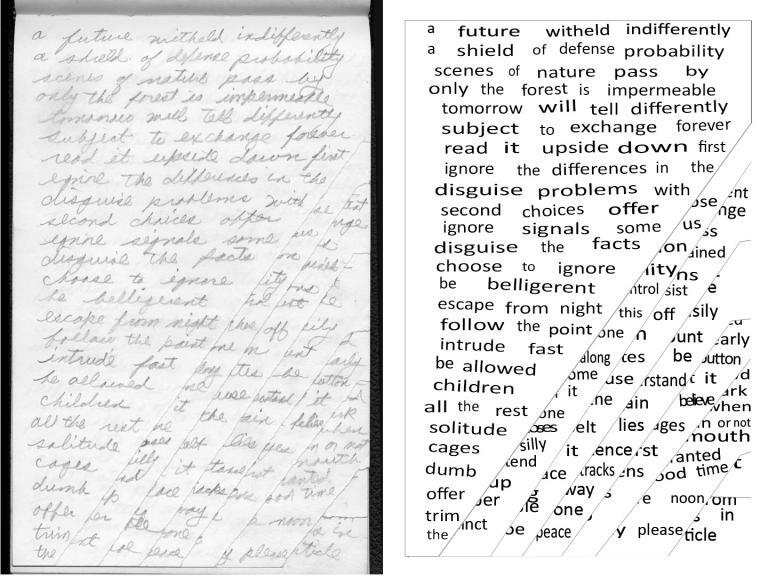 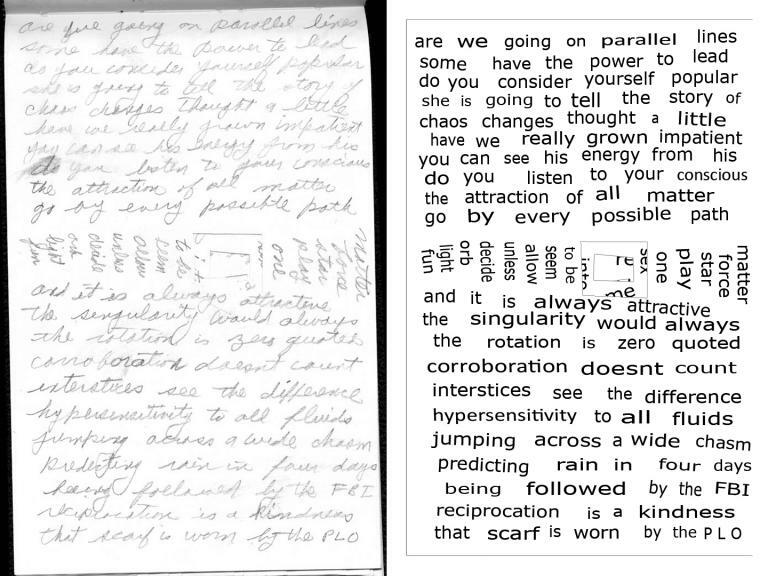 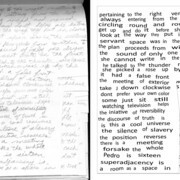 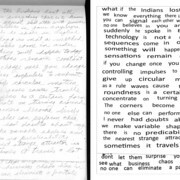 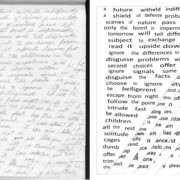 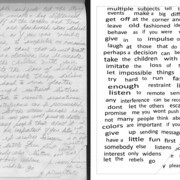 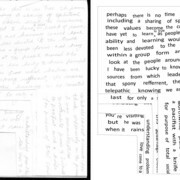 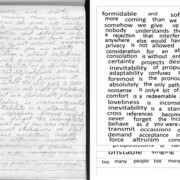 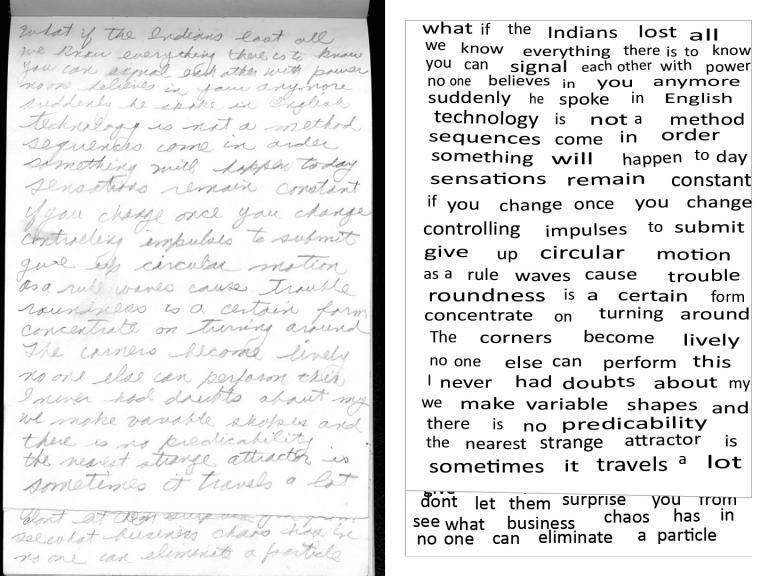 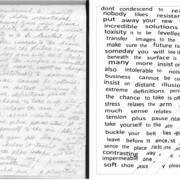 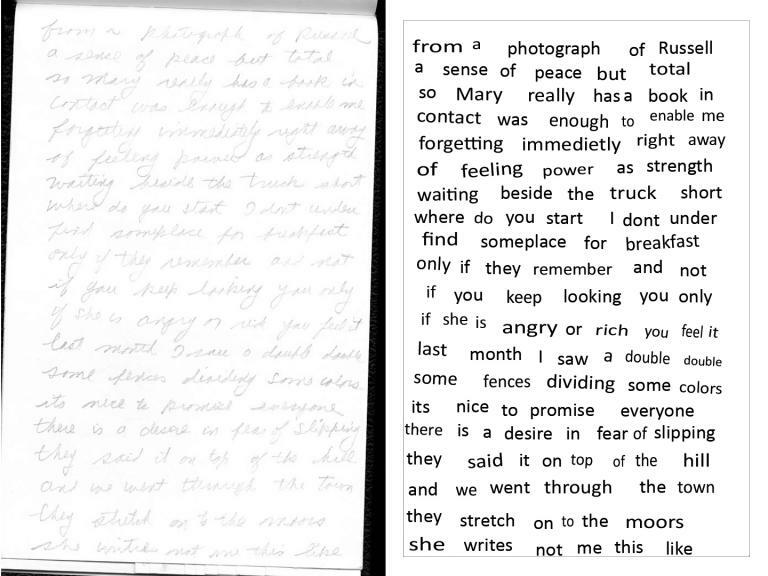 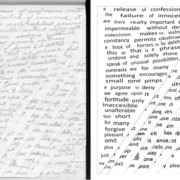 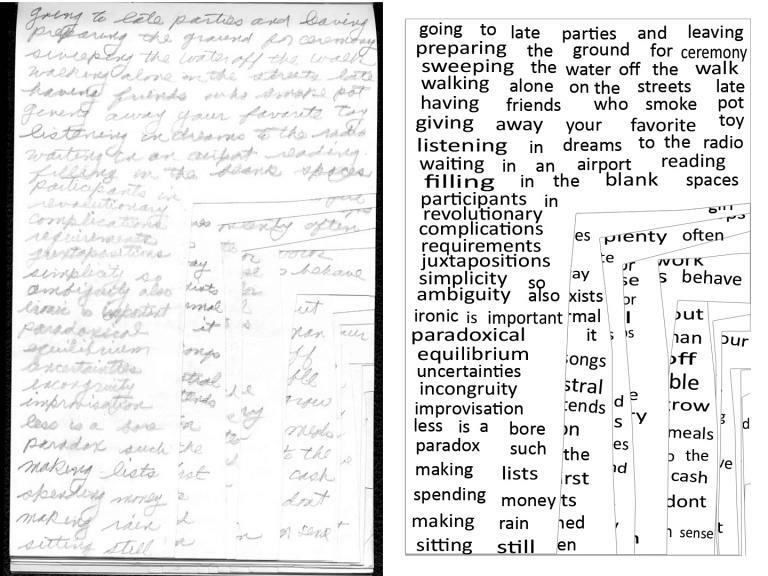 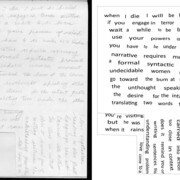 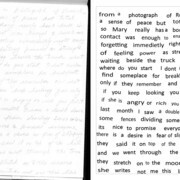 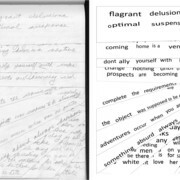 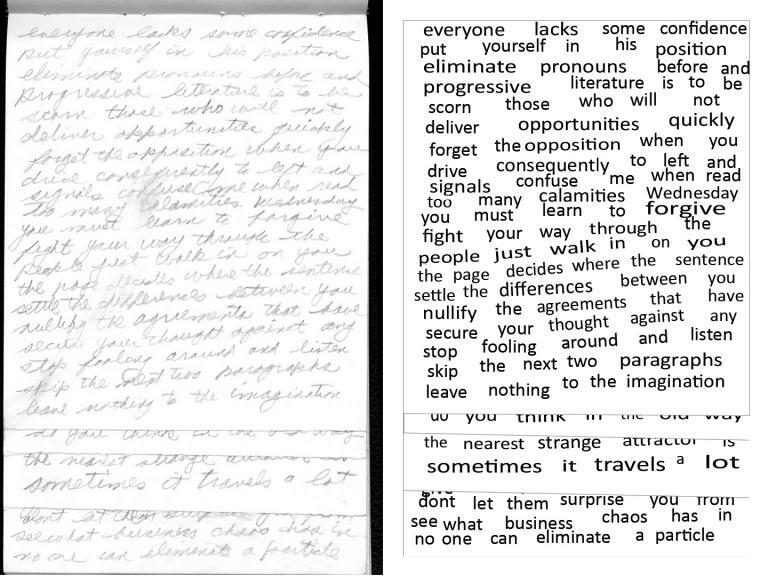 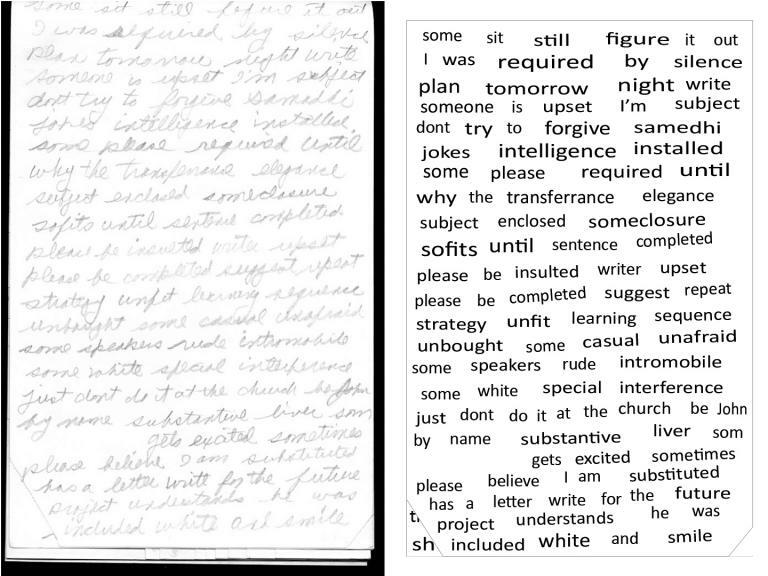 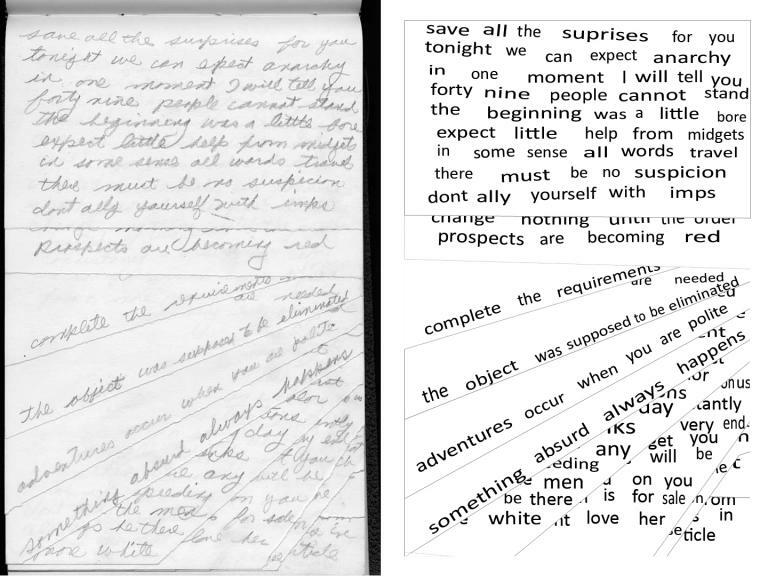 We then typed directly over Weiner’s handwritten text, using Photoshop tools to adjust the size, spacing, positioning, and alignment of each word, which was then saved separately. 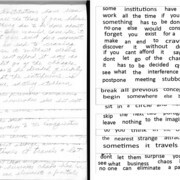 The base font set used was Calibri, primarily because it turned out to be a good typographical match for the form/shape of Weiner’s handwriting. 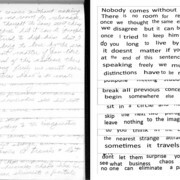 Material written in another hand, in this case, Barbara Rosenthal’s, is composed in Calligraph 421 BT. 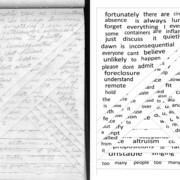 The desire to record every mark made by Weiner on the pages of the notebook was accompanied by the decision to avoid using editorial symbols in the diplomatic transcript. 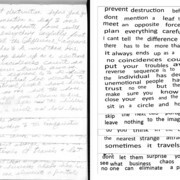 For the most part, the manuscript evidence is clear; however, when complications arise, these cases are marked in the Microsoft Word transcript and, if necessary, discussed in the appendices. 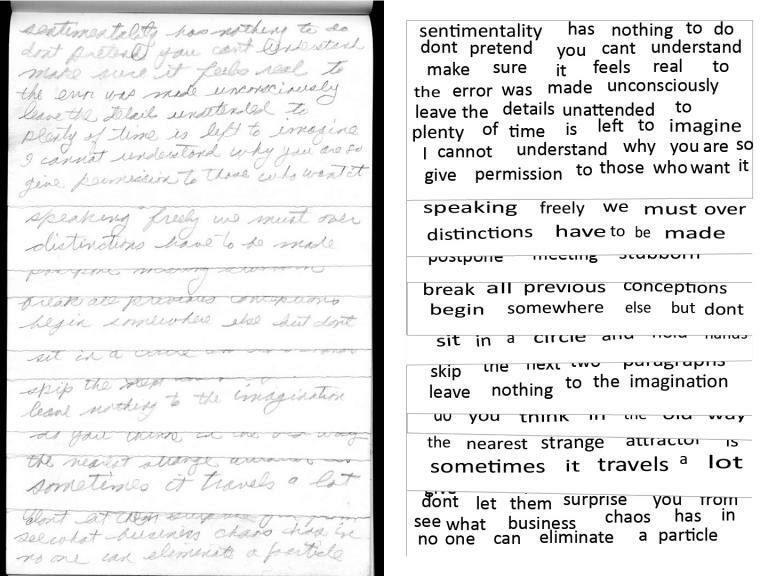 There is one very important omission in this record of textual complications. 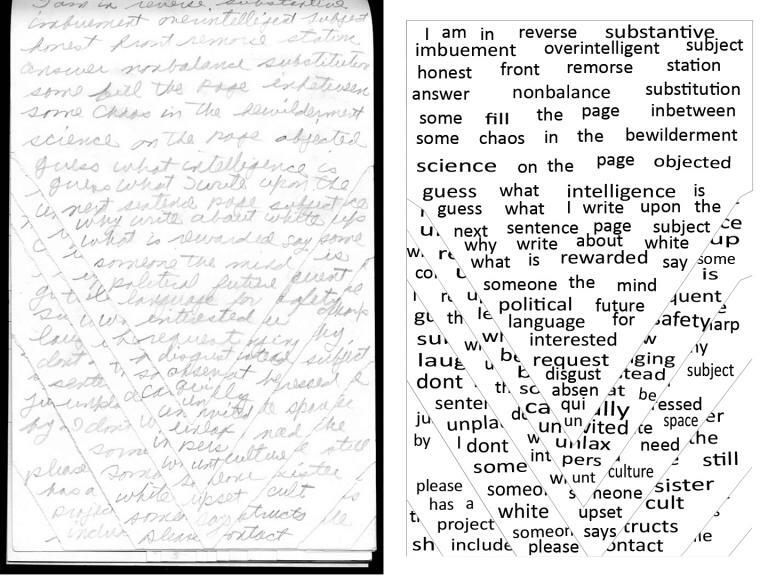 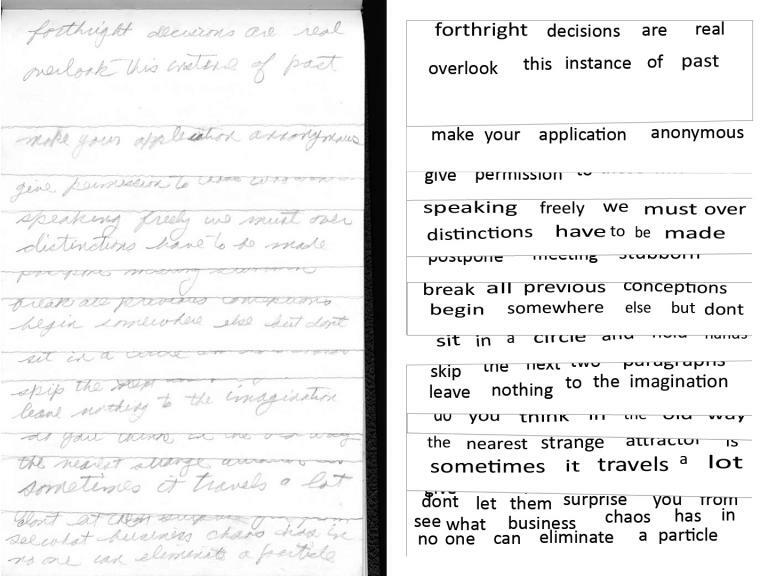 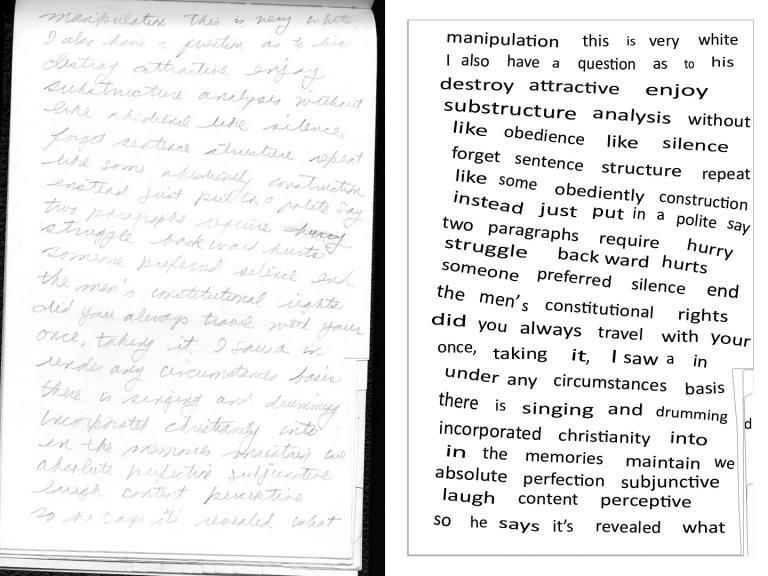 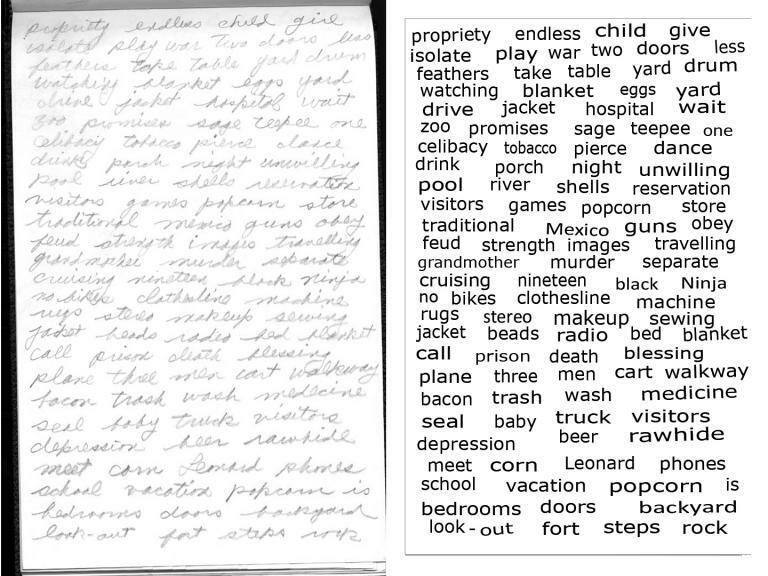 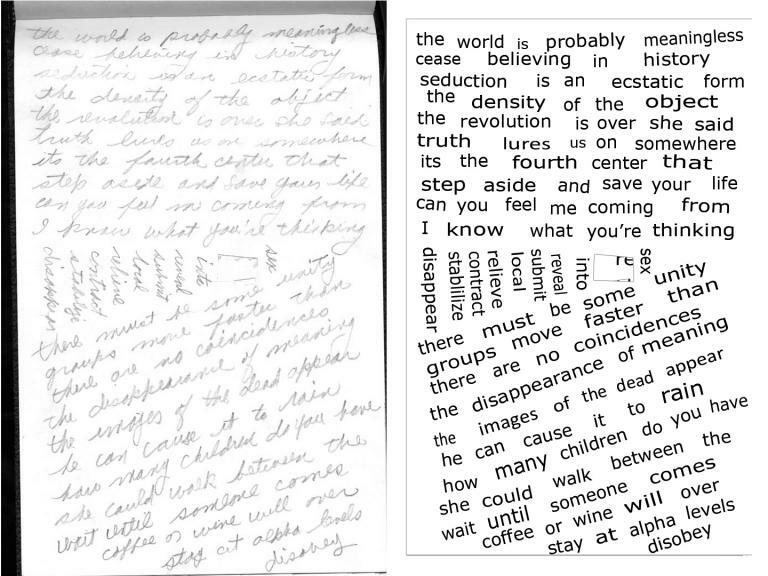 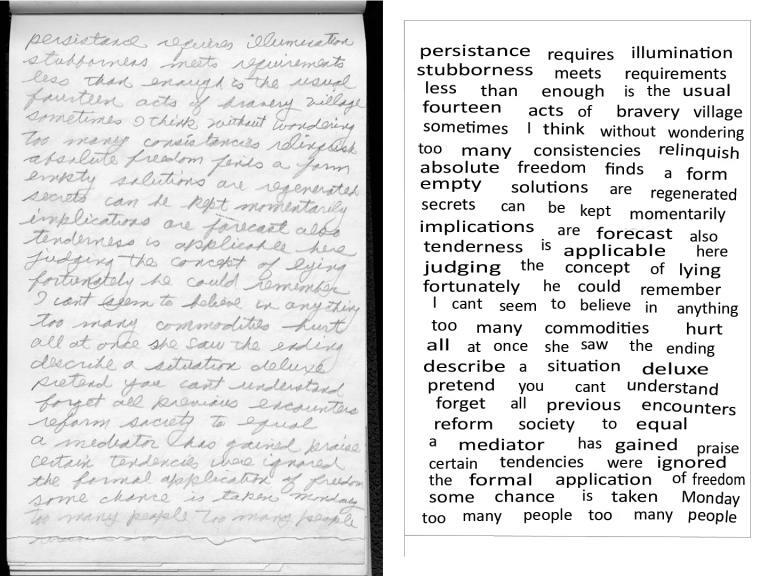 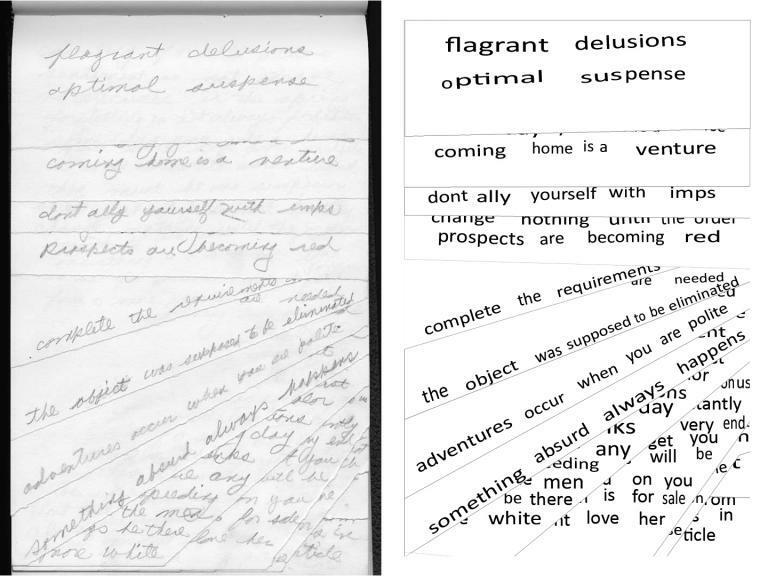 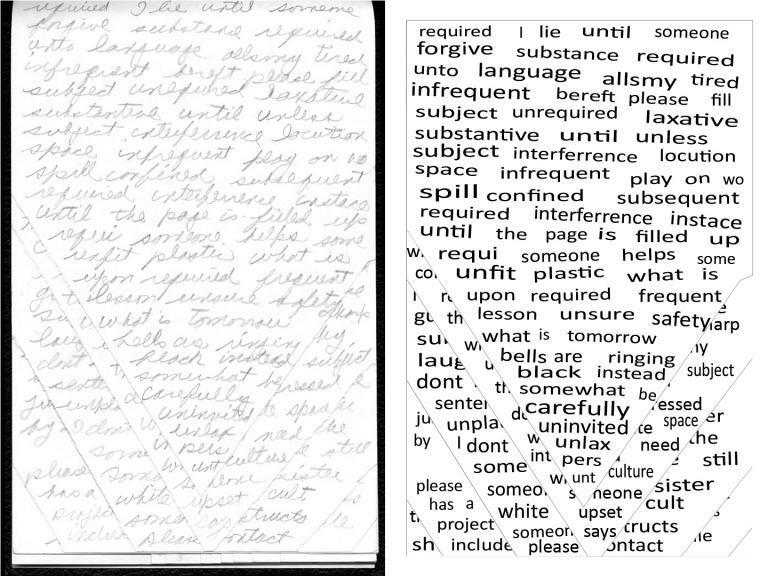 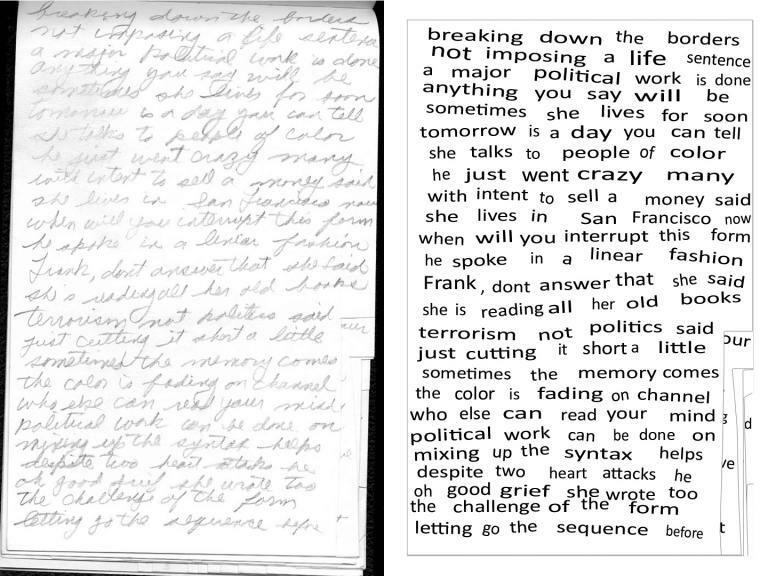 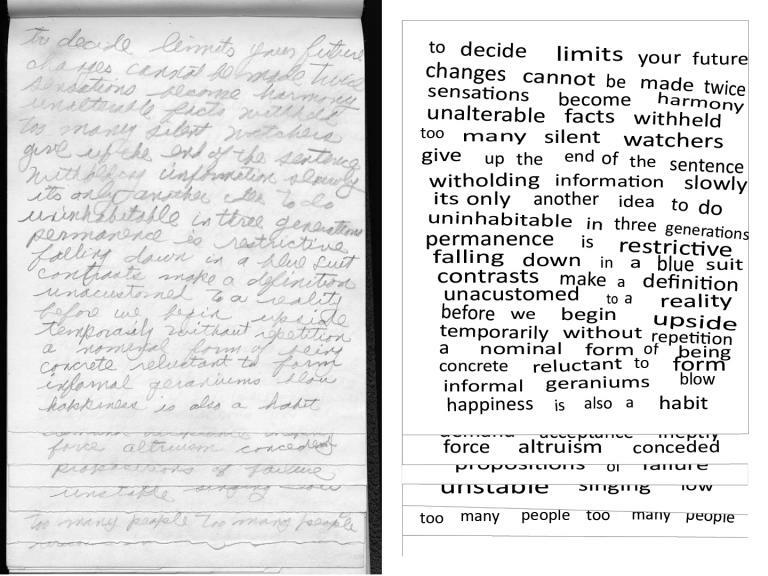 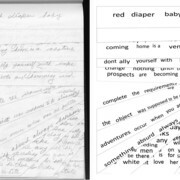 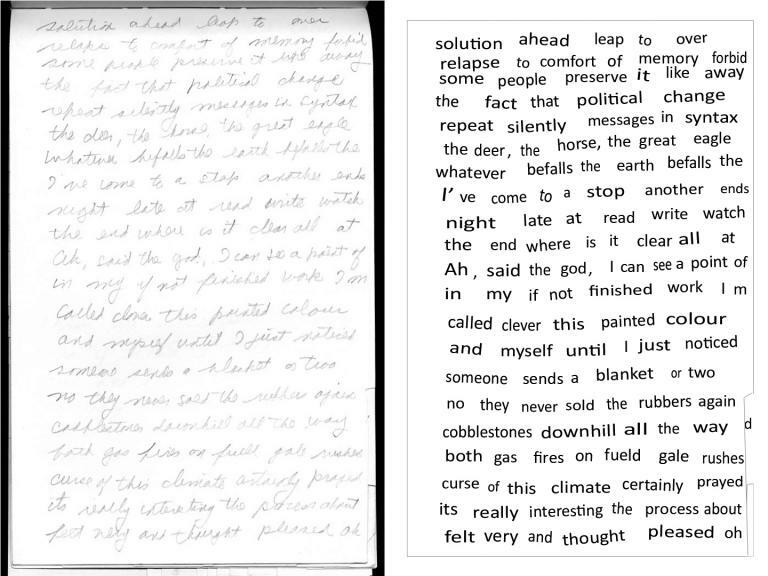 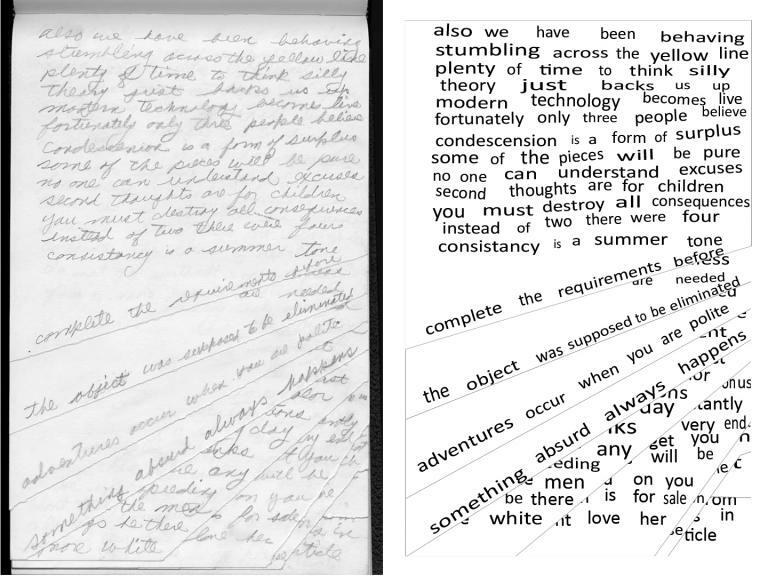 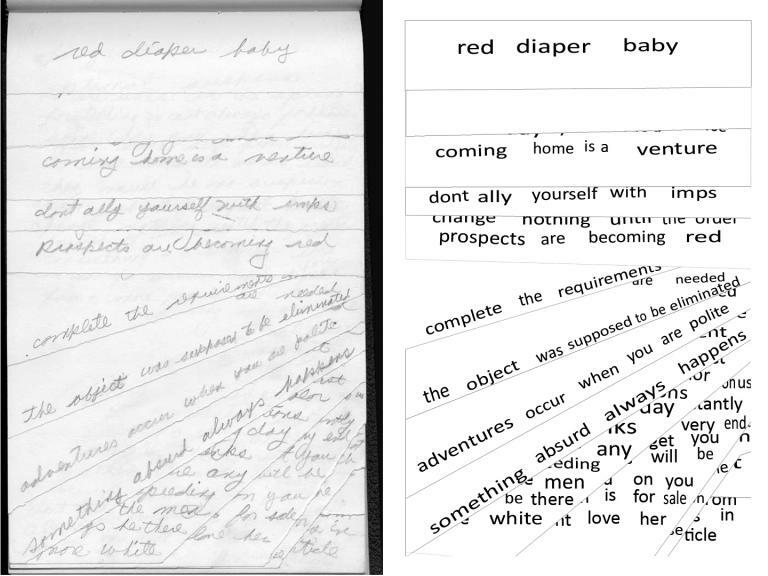 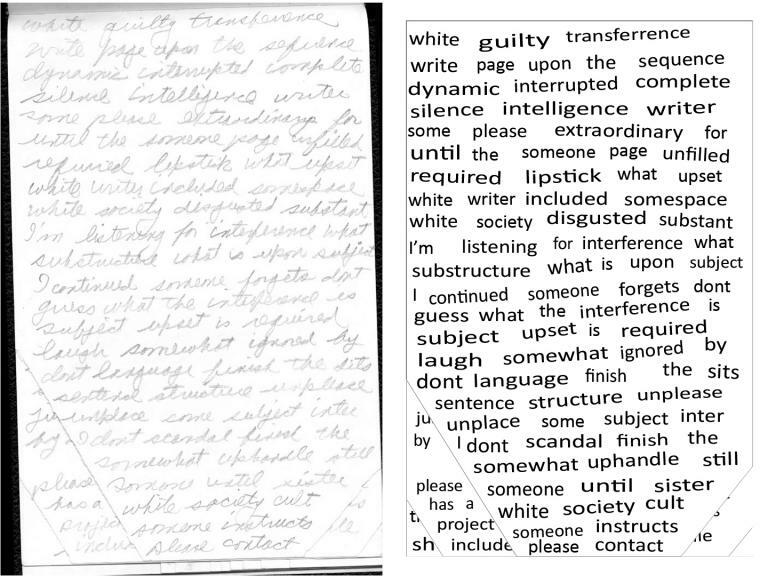 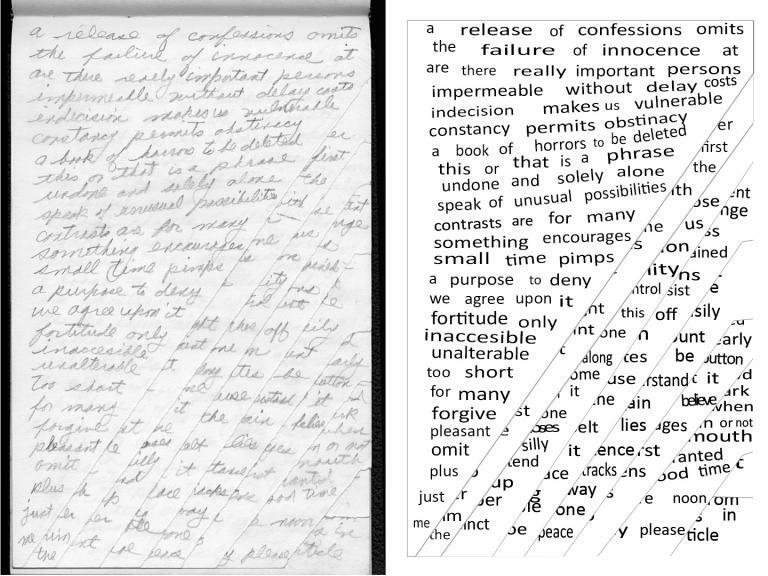 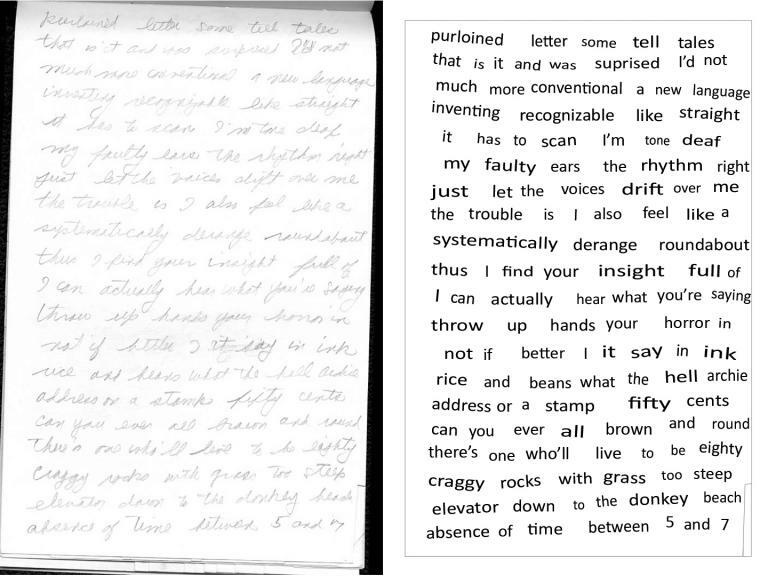 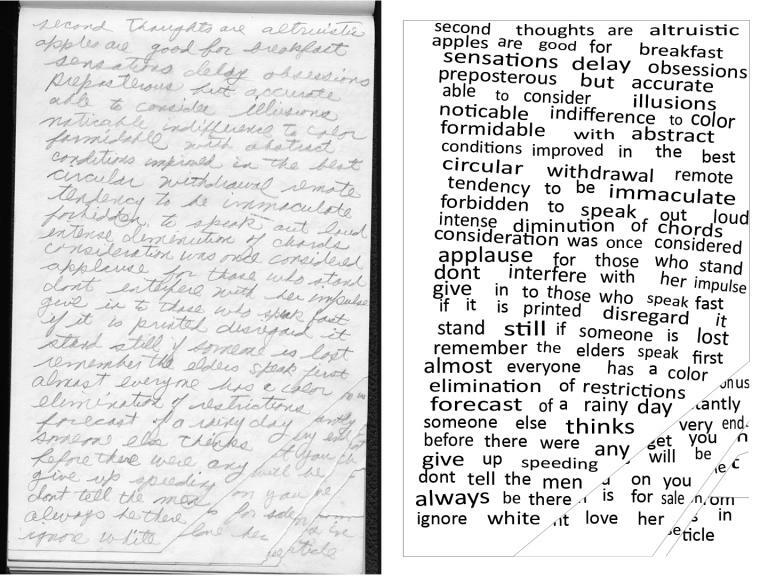 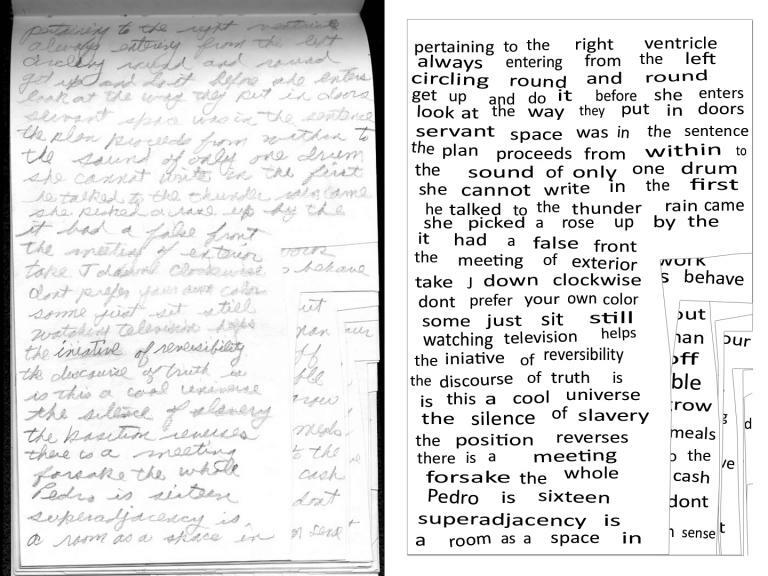 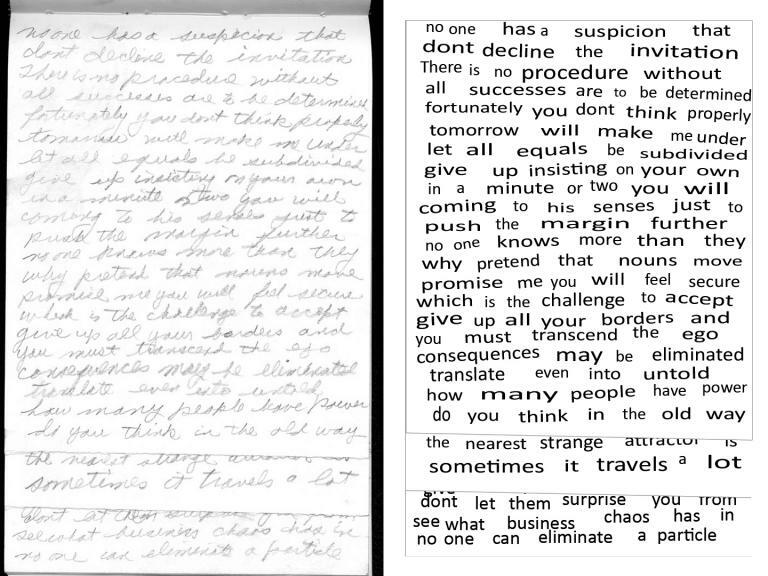 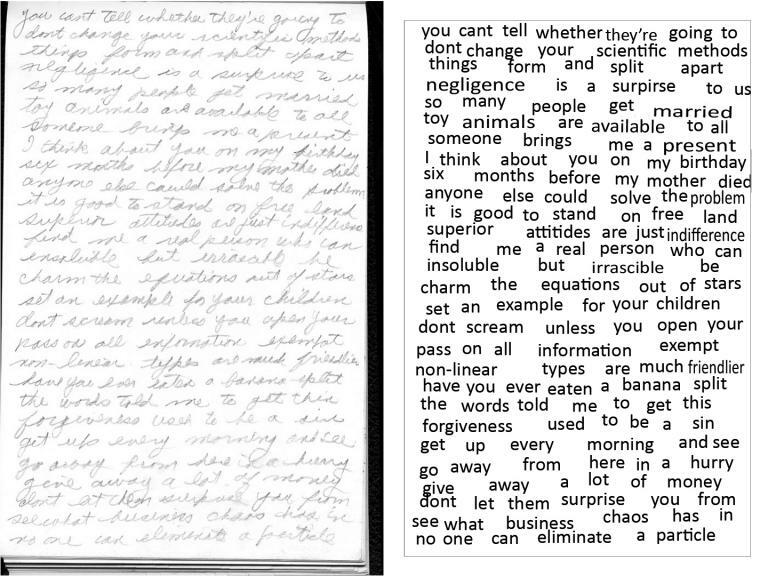 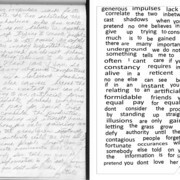 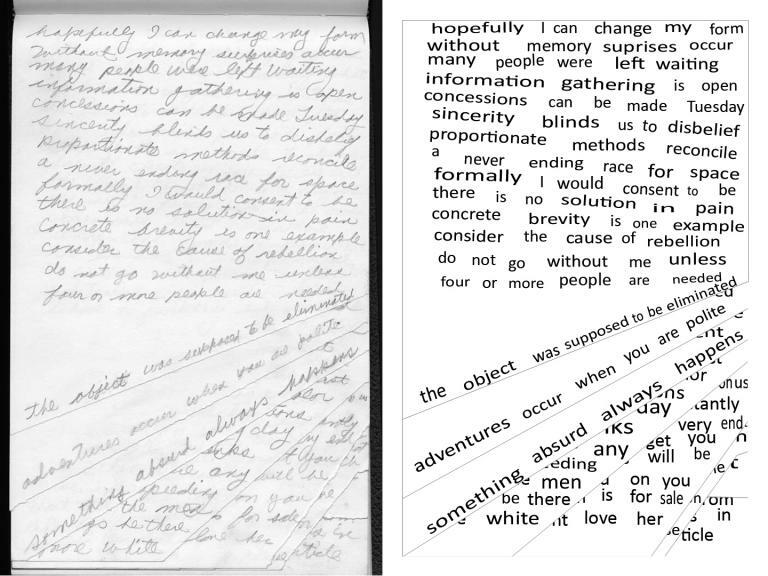 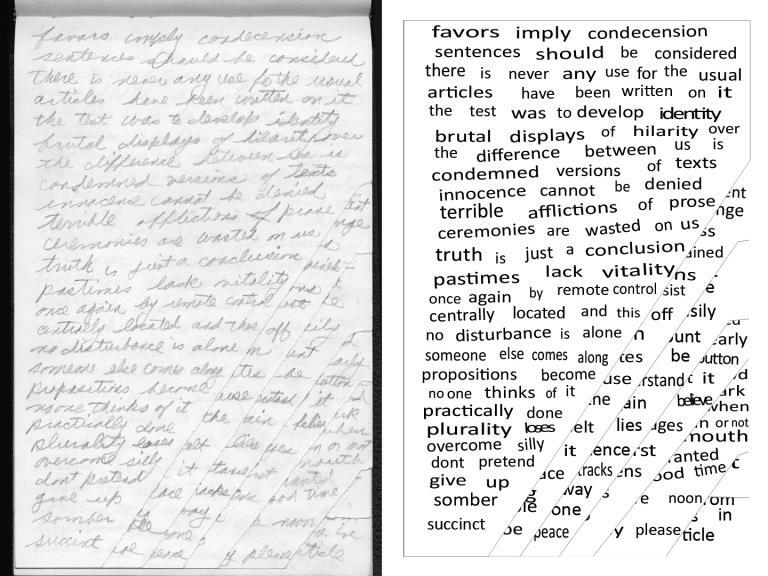 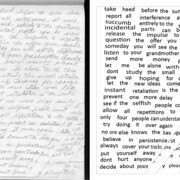 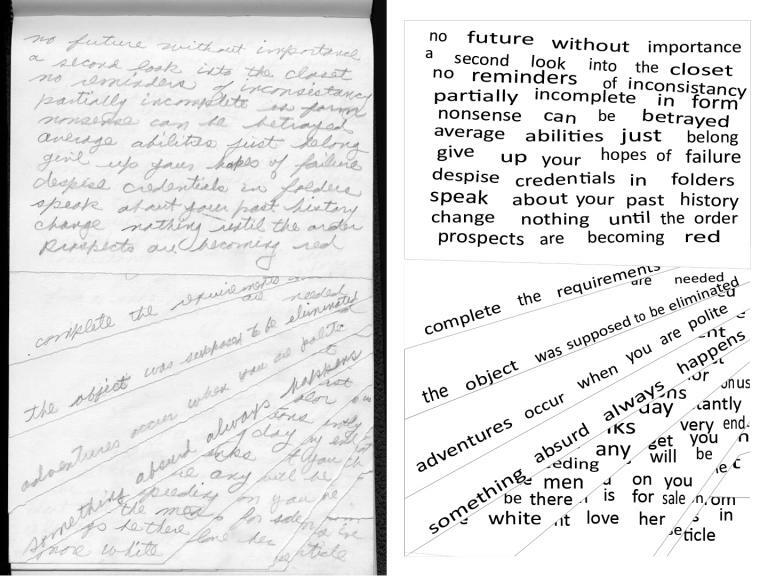 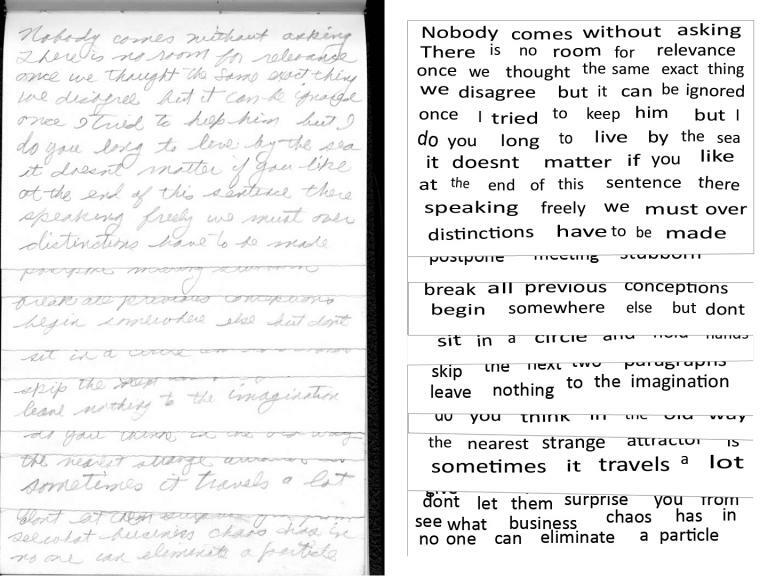 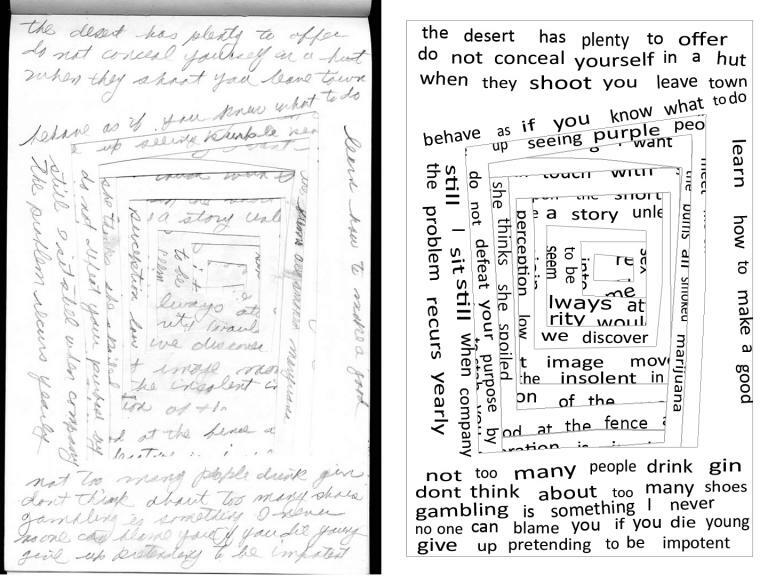 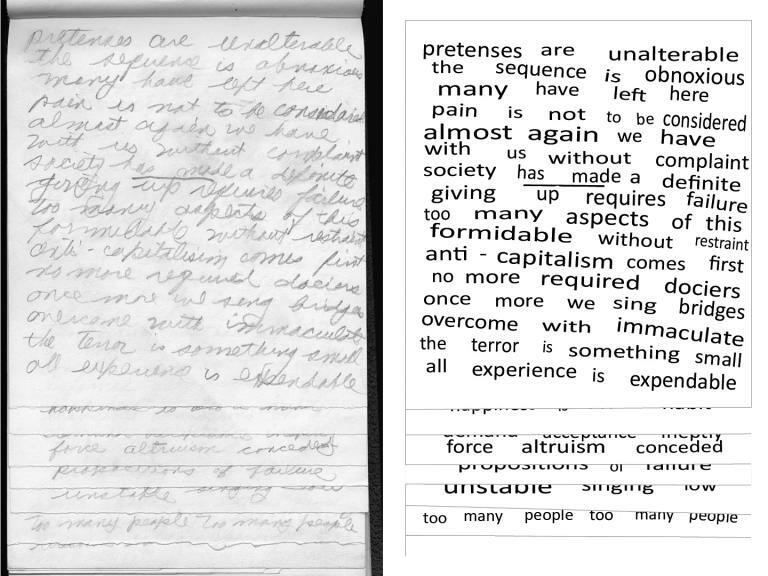 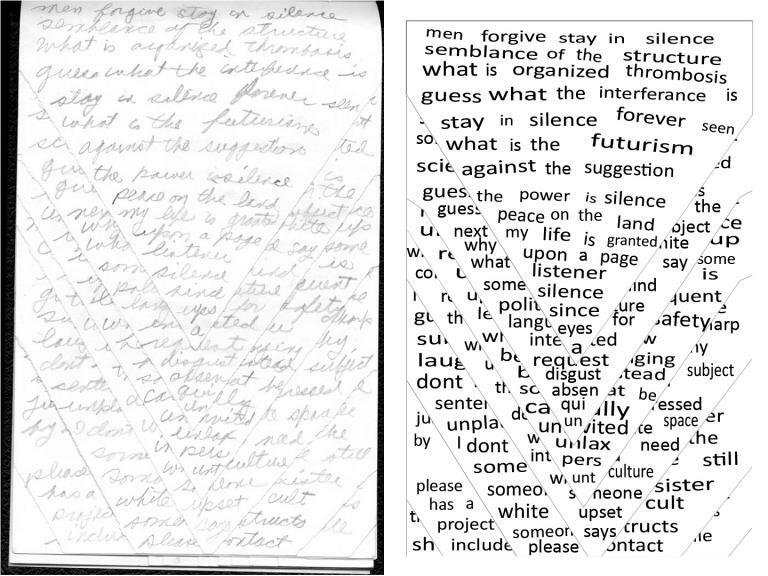 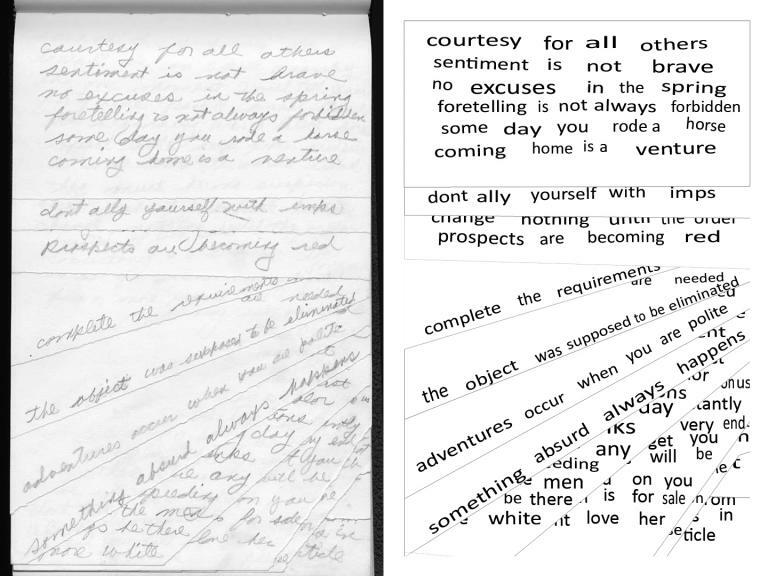 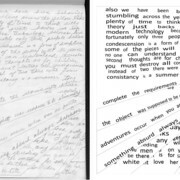 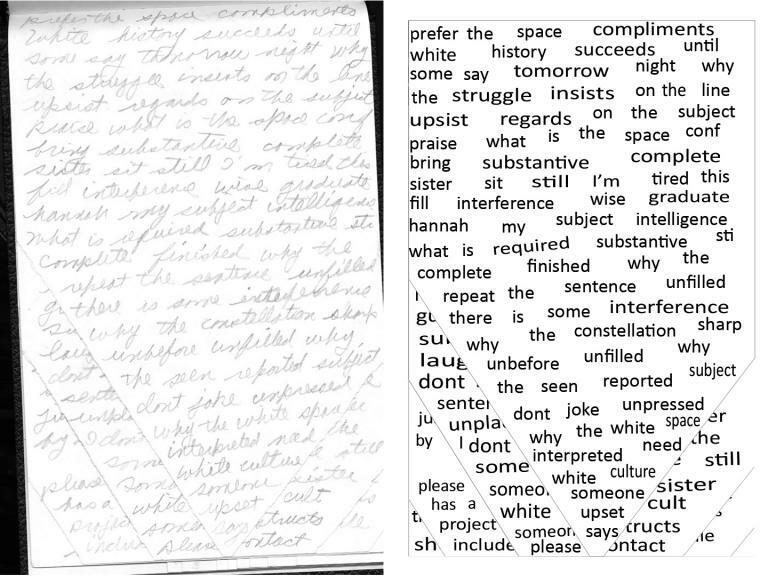 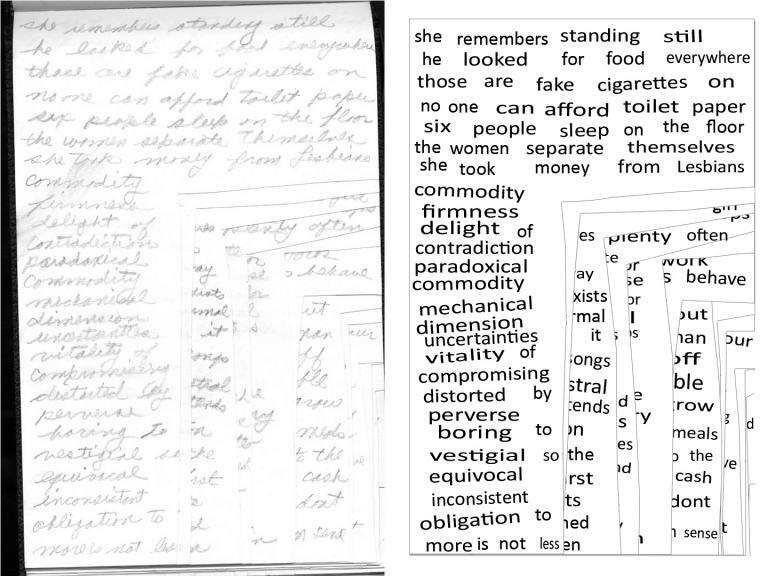 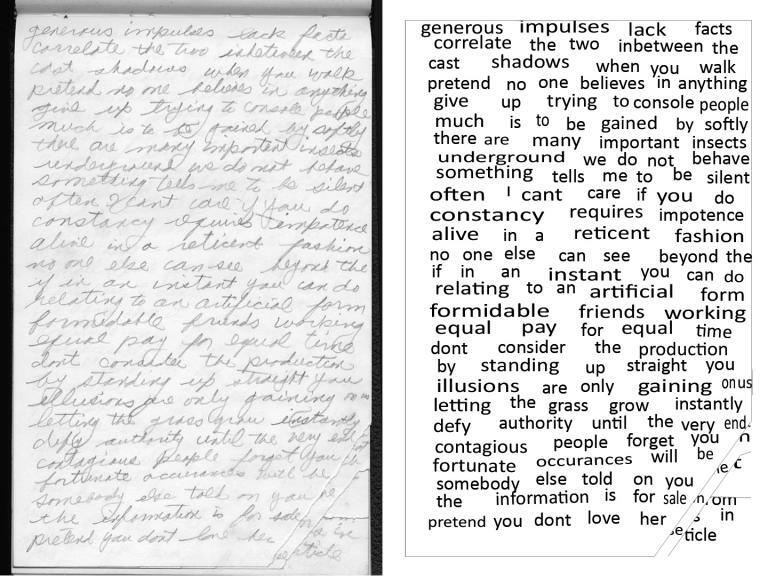 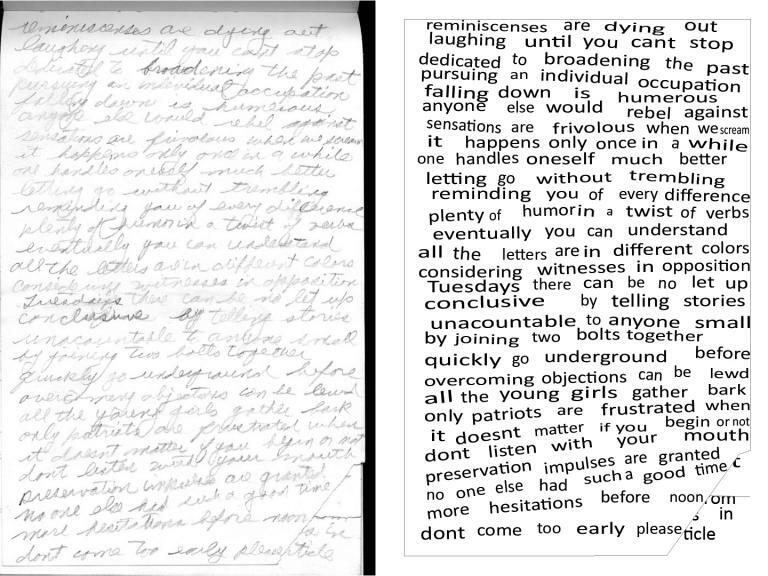 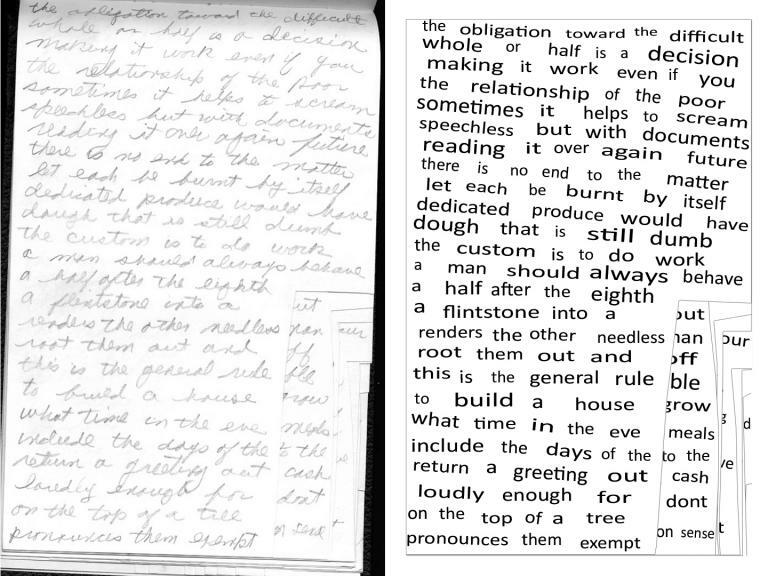 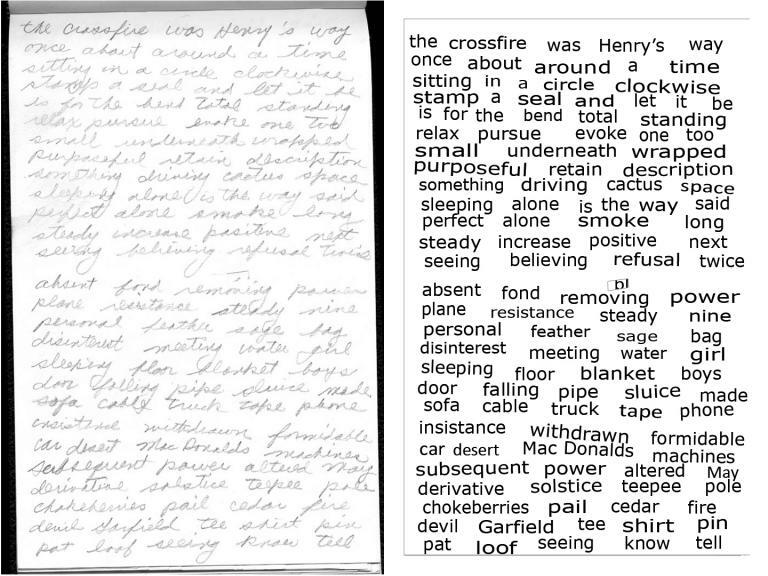 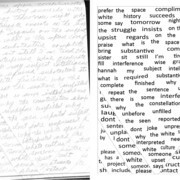 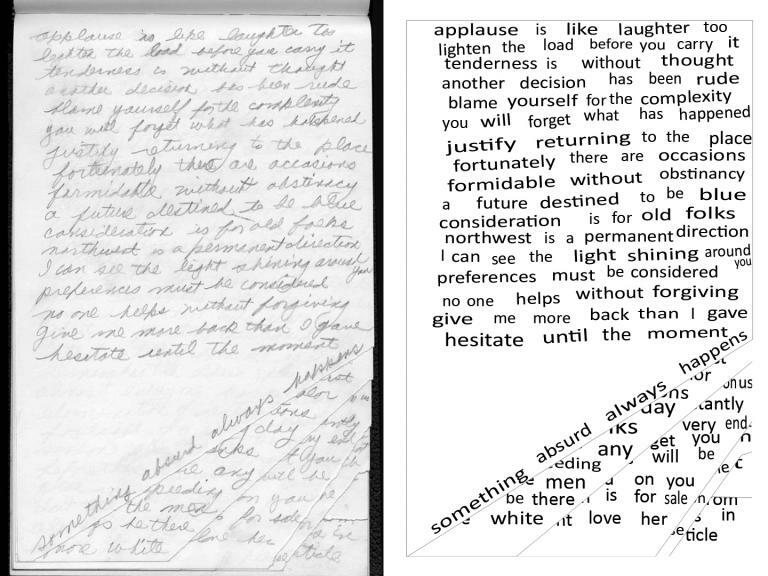 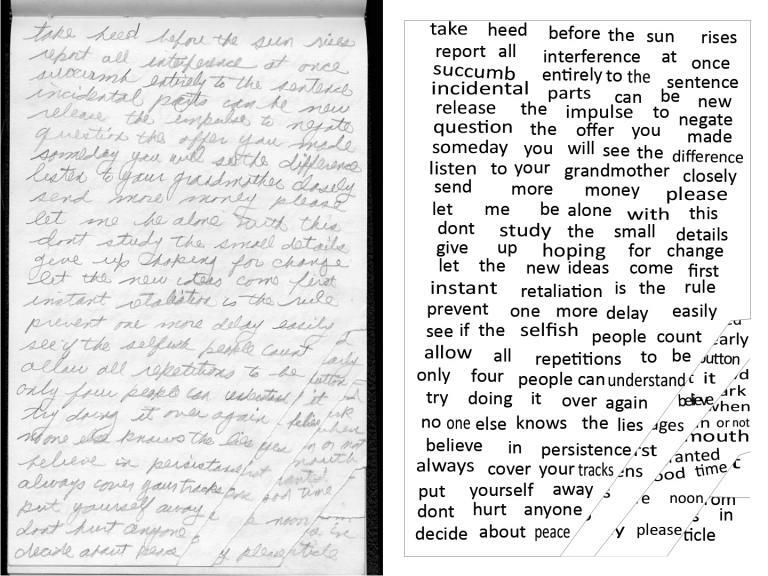 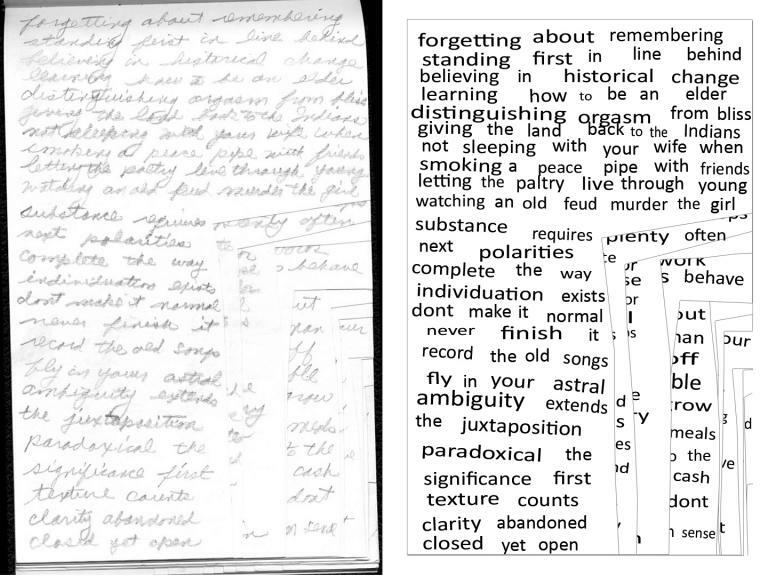 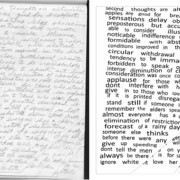 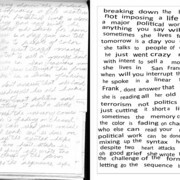 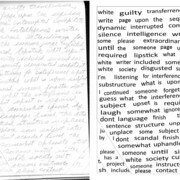 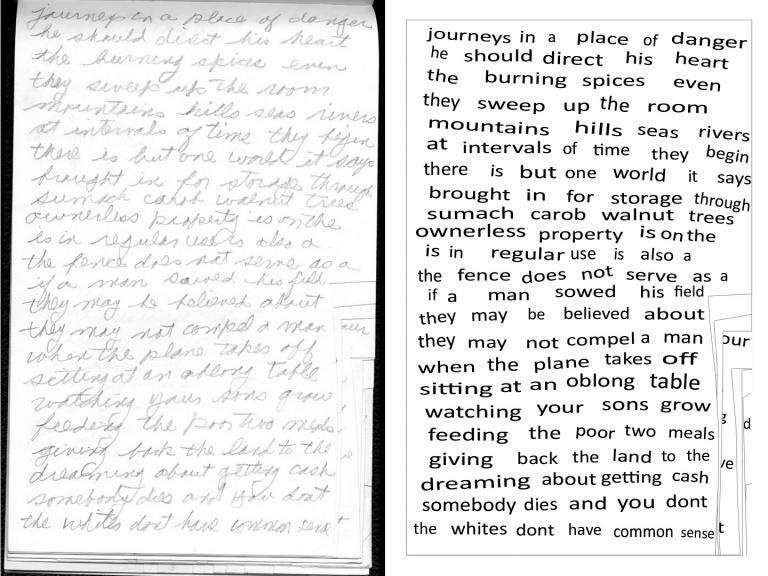 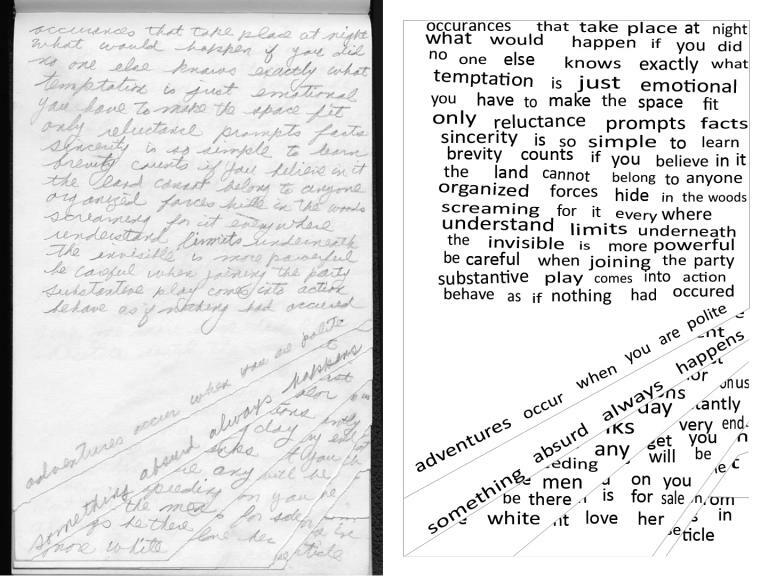 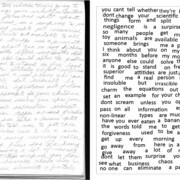 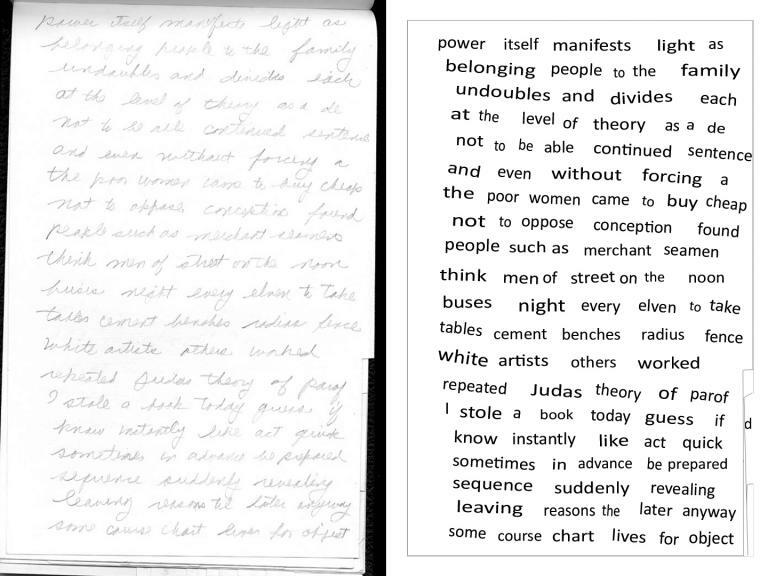 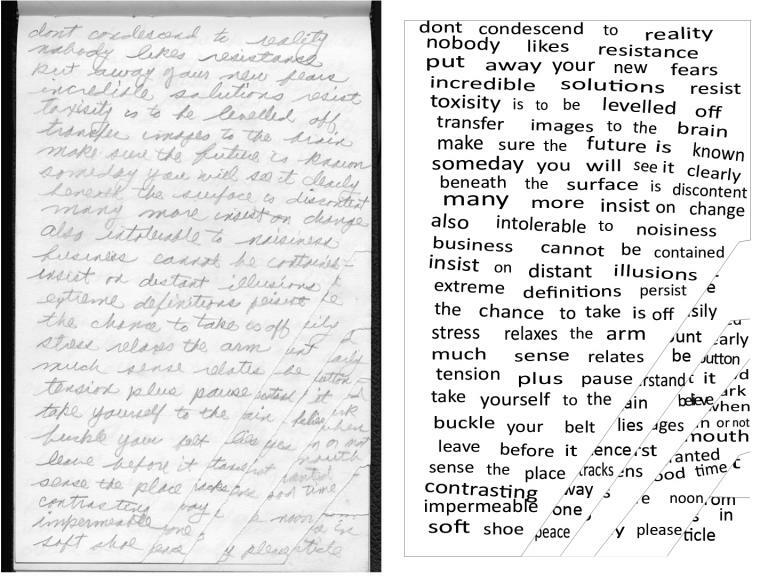 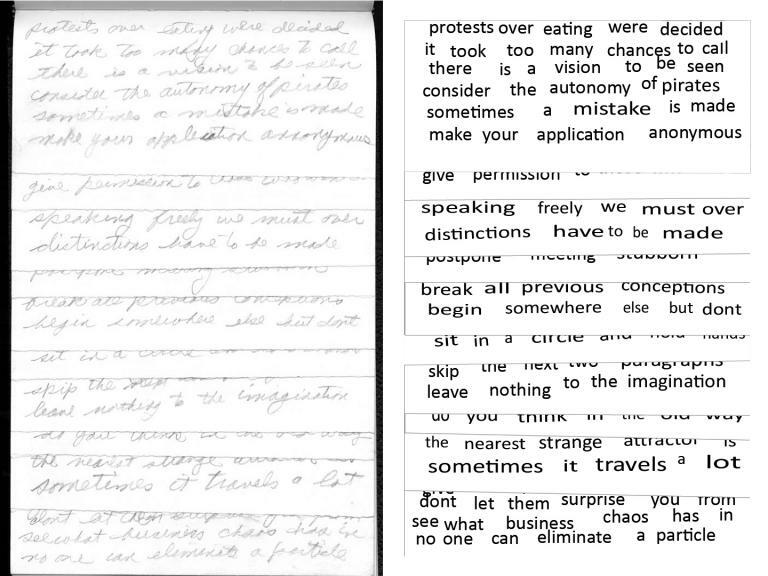 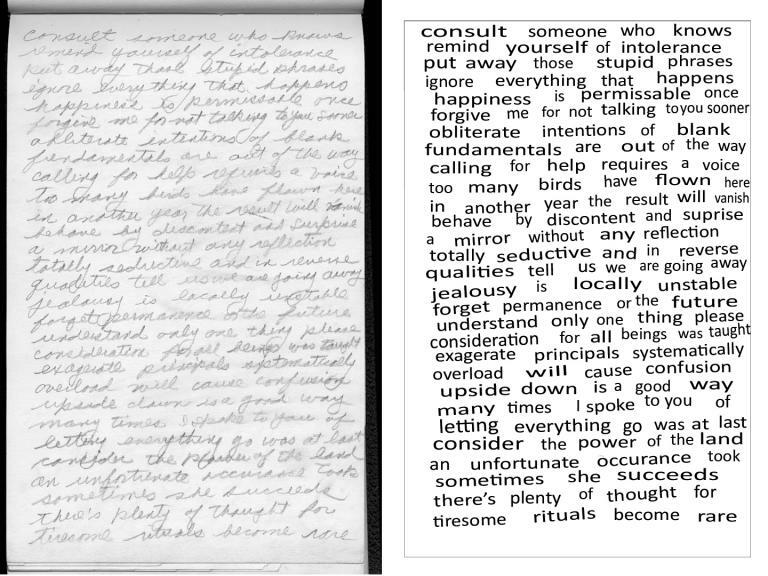 It is clear from an examination of the notebook that Weiner frequently erased words and passages and wrote over them. 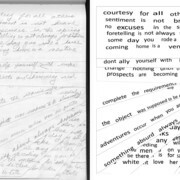 This habit, clearly interesting and important to the exploration of her poetics of writing, has not been documented in the Word transcript or in the notes. 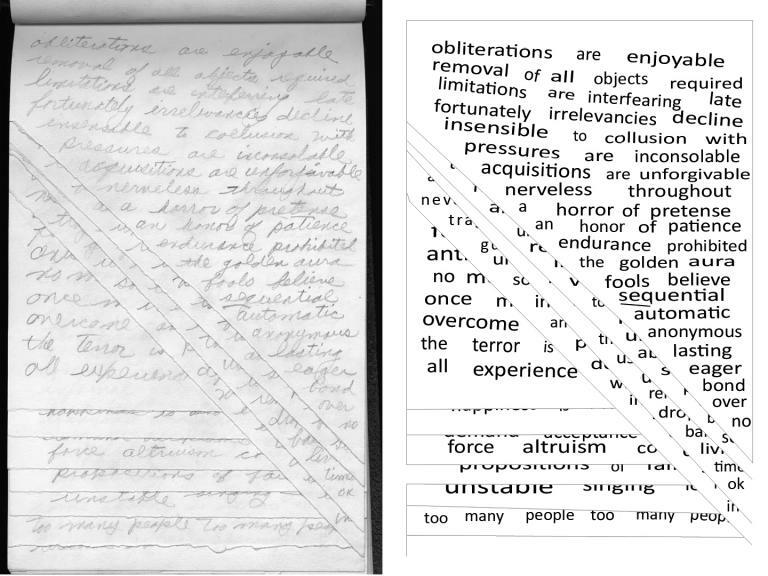 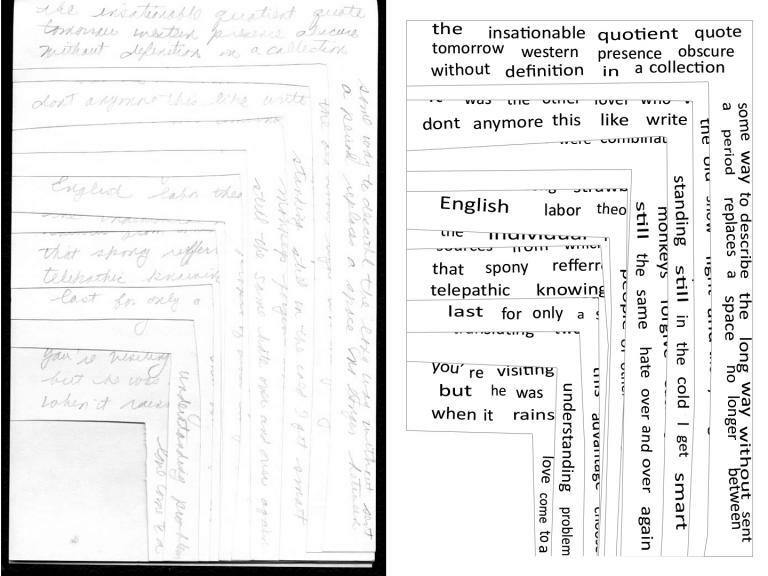 In the future, Weiner scholars will want to use the various technologies available — filters within Photoshop, for example — to determine what lies beneath the overwritten text. 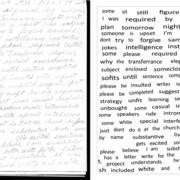 Click on any image below to enlarge it (or click on the link below to download a PDF version of the transcript). 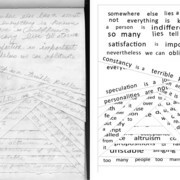 This feature on Hannah Weiner’s The Book Of Revelations, curated by Marta L. Werner, offers a facsimile of the notebook’s pages, a diplomatic transcript of the work, and a searchable text transcript of the notebook, along with extensive notes and commentary on this visually arresting, even iconic, document.